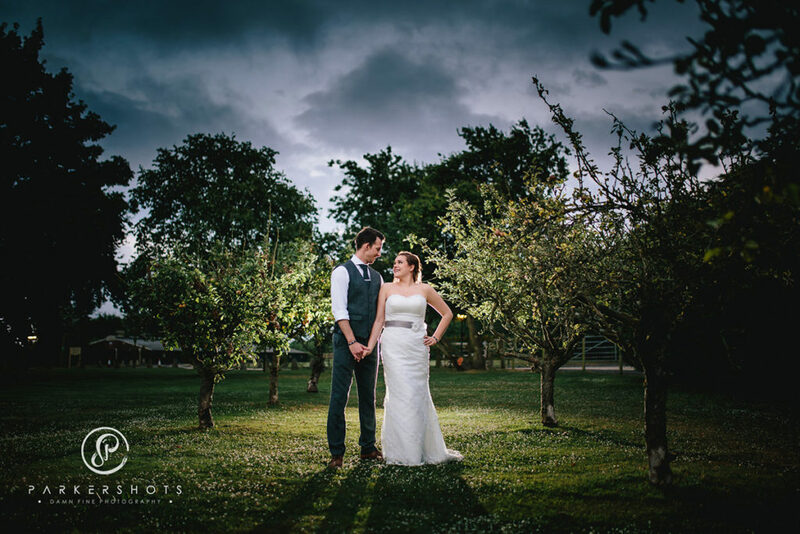 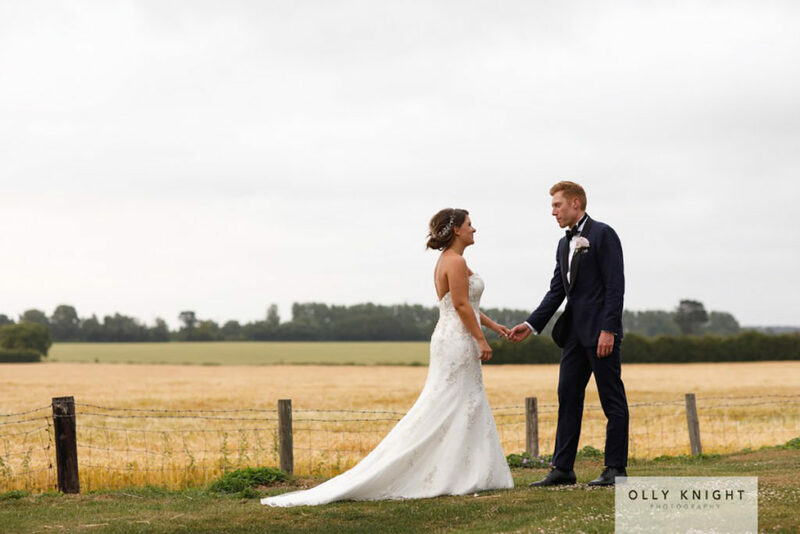 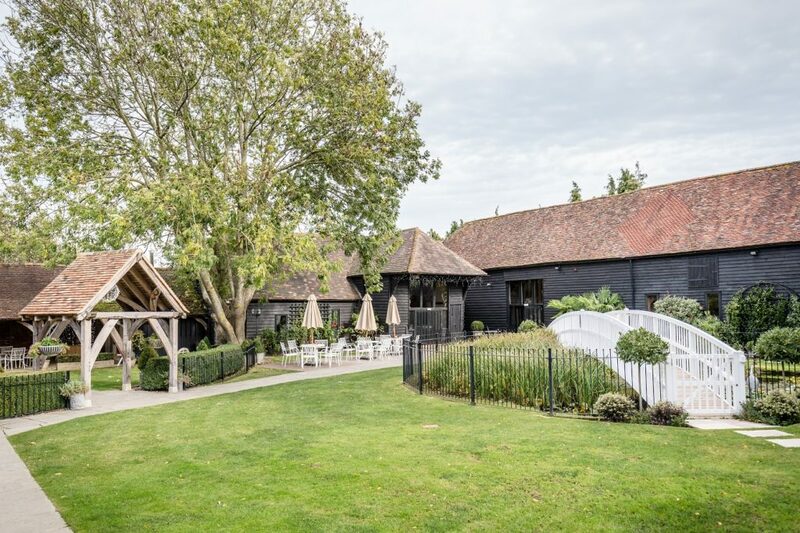 Winters Barns is just on the southern outskirts of Canterbury and is surrounded by open fields and beautiful views, yet close to the many hotels and facilities of Canterbury. 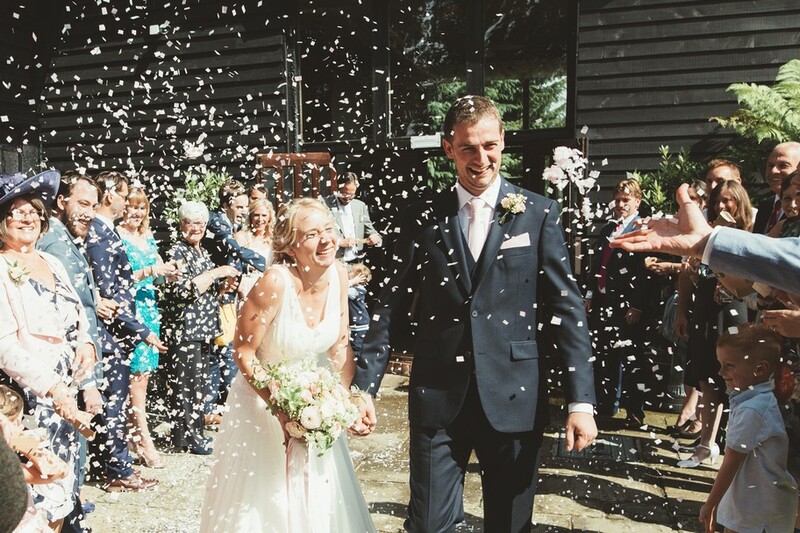 From booking you have access to our team to help plan and schedule your wedding. 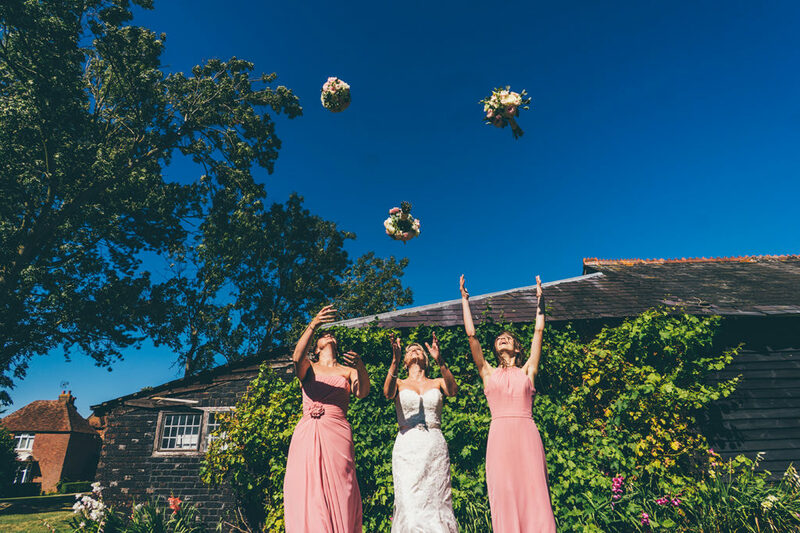 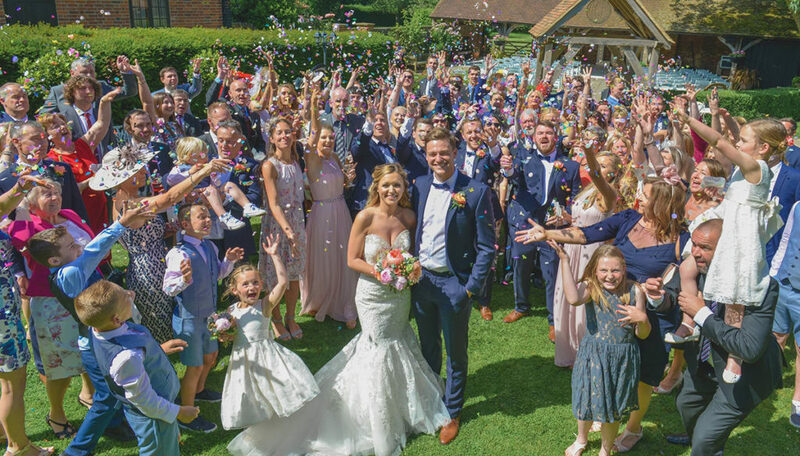 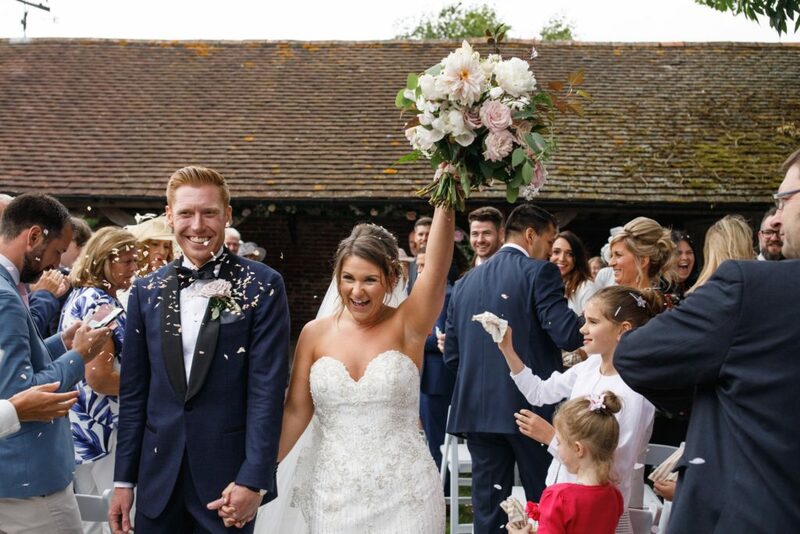 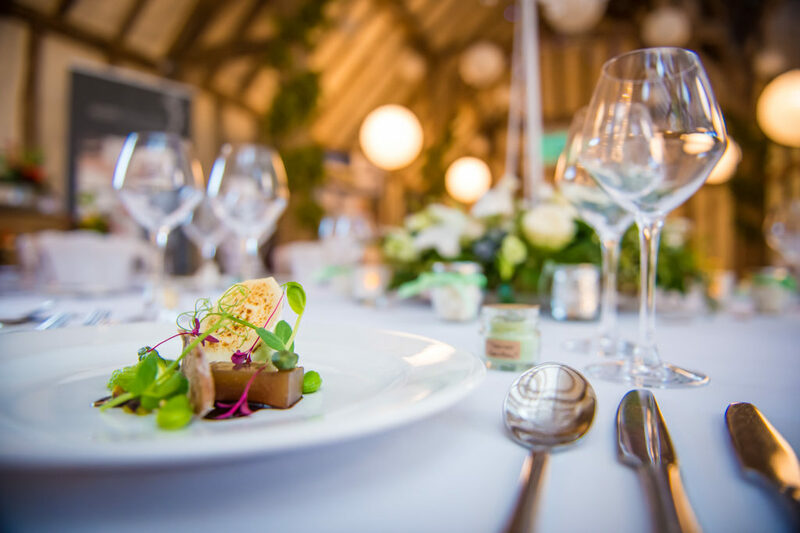 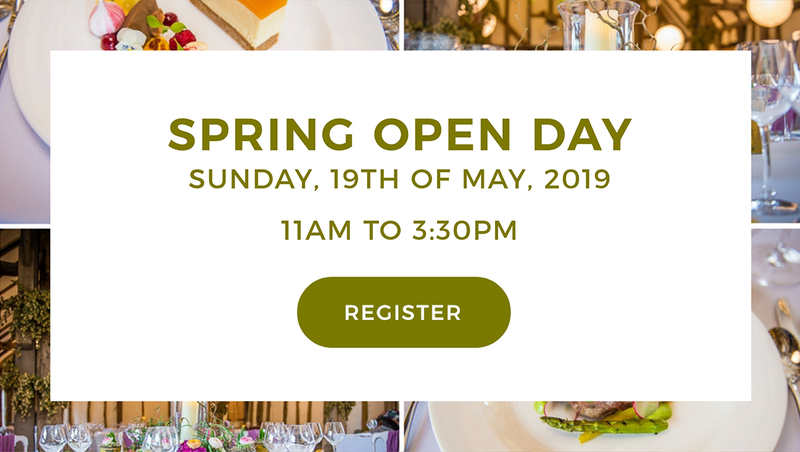 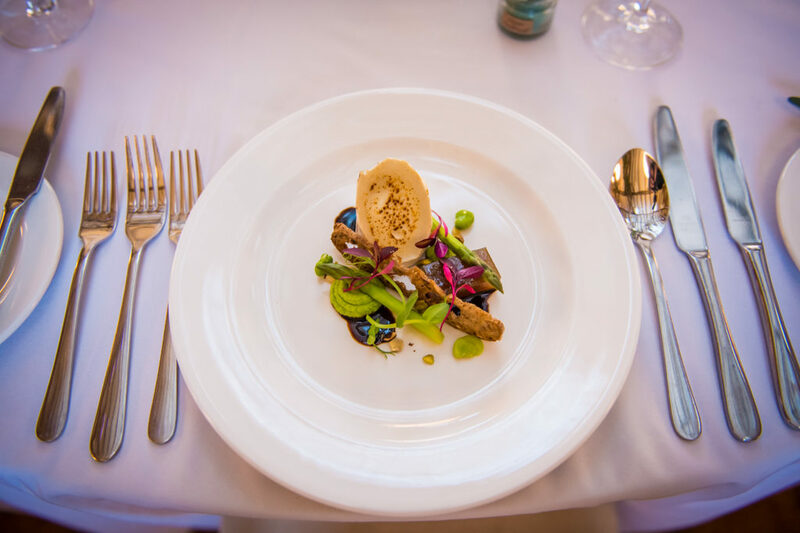 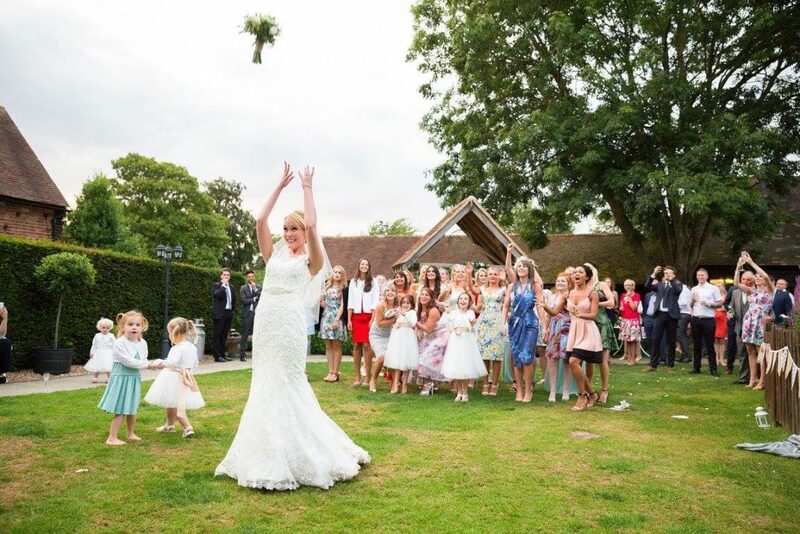 We offer unlimited phone and email support, co-ordinating site visits, menu and wine tastings and provide a dedicated team of wedding co-ordinators to be your personal assistants on the day. 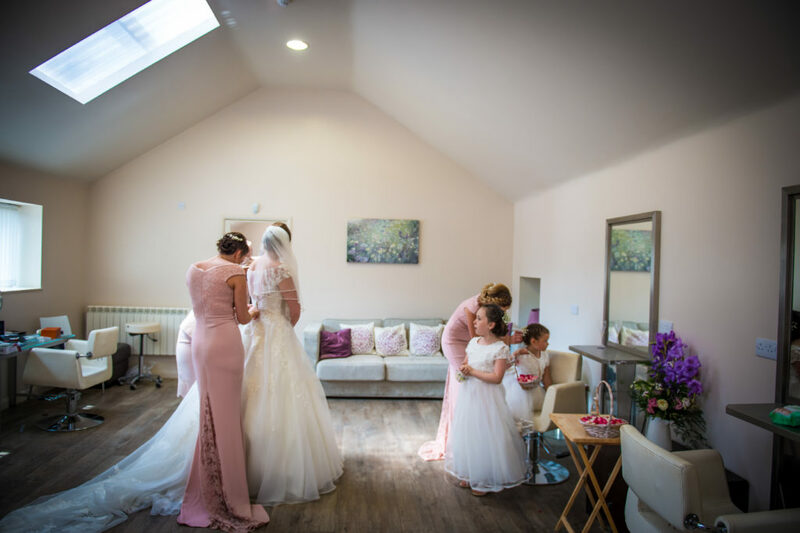 You will also have a planning meeting well in advance of your wedding to finalise and check all the details, and produce a detailed schedule of the day. 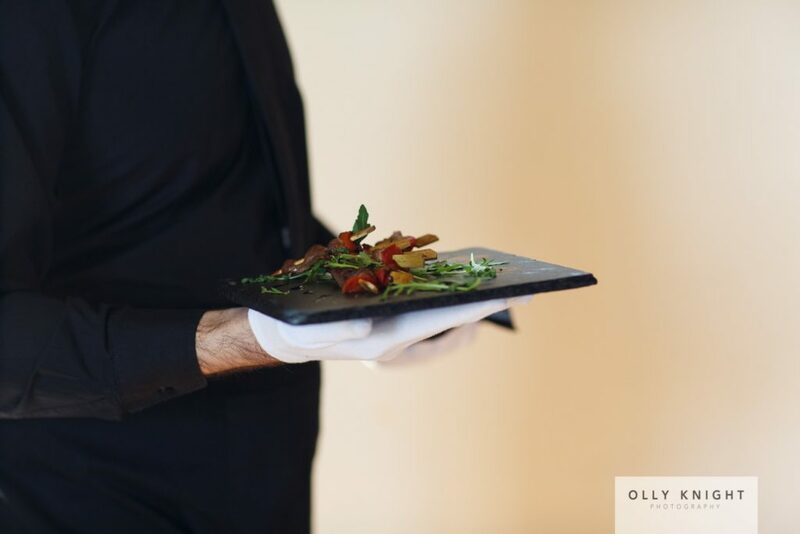 To make the morning less stressful, our couples can pre-order food and drink to be ready for their arrival in the Salon or the Pump Room. 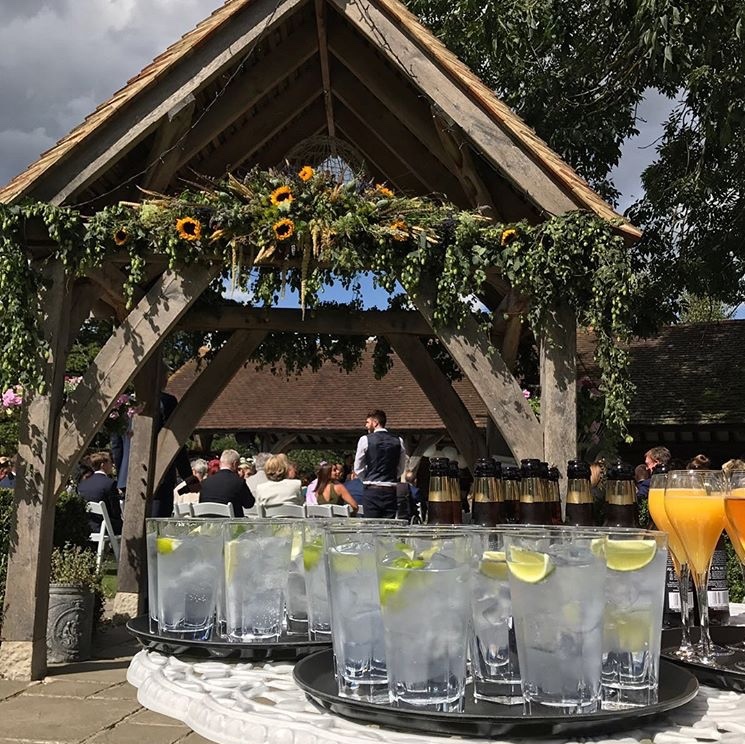 Drinks can be ordered directly from the bar from 11.00am. 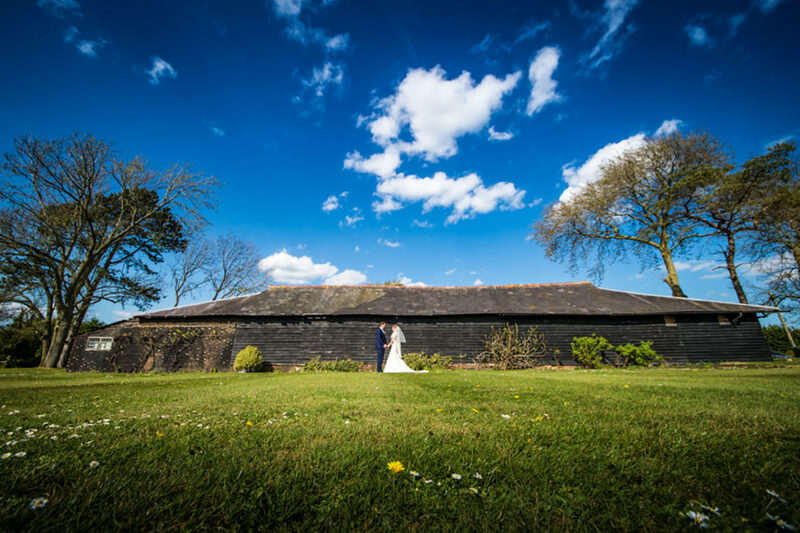 We also have extra facilities within our grounds to make your wedding extra special. 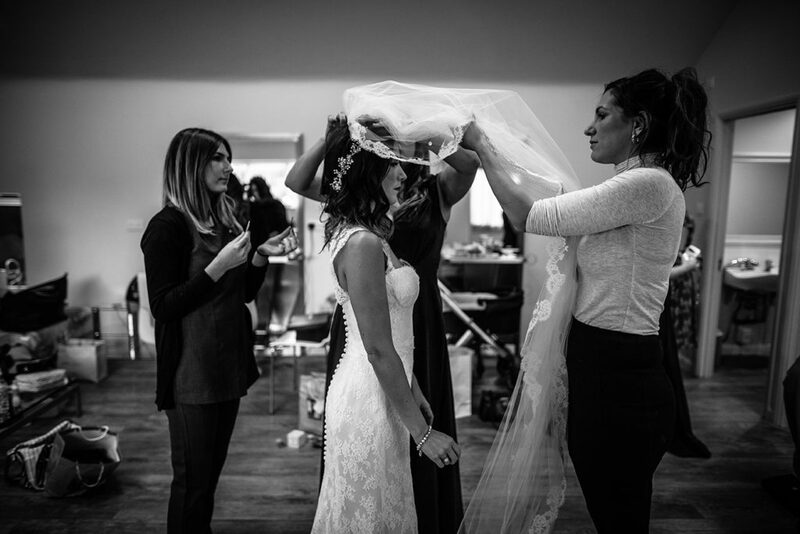 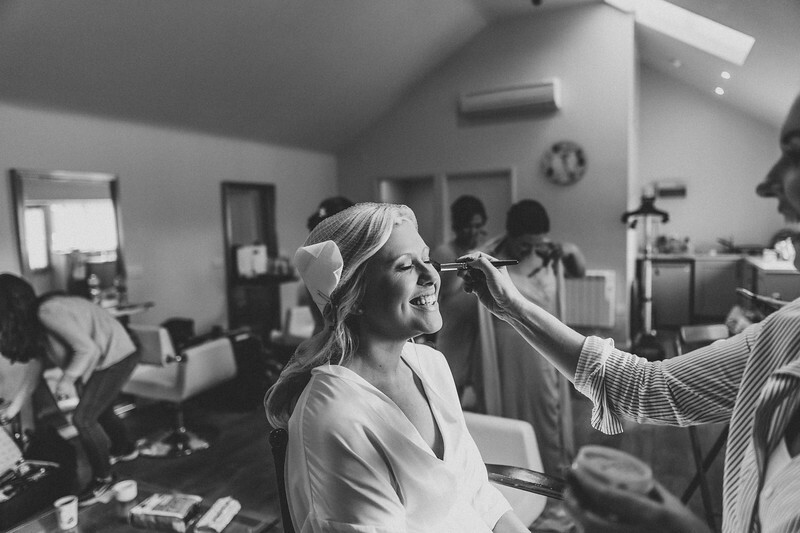 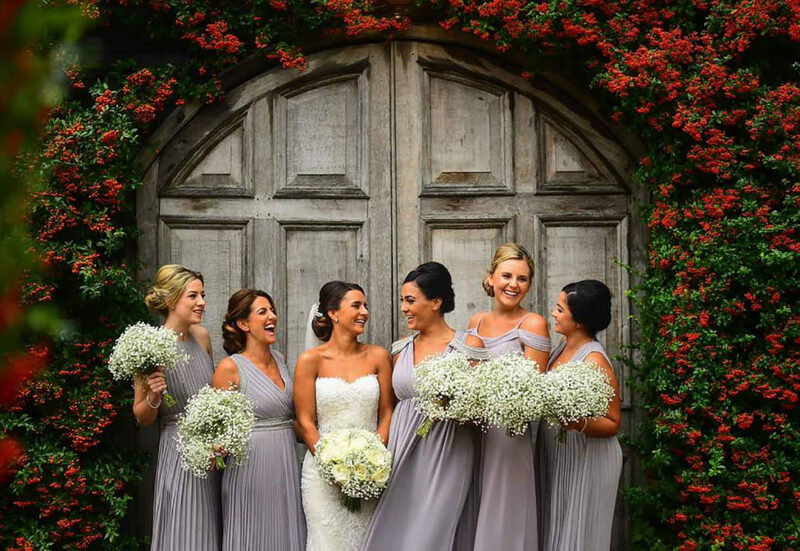 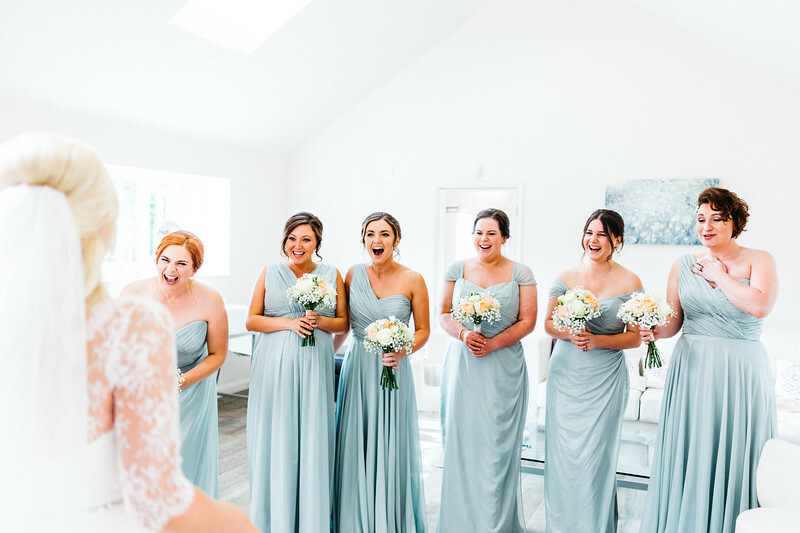 Before the ceremony, you and your bridesmaids can get ready in our large modern, air-conditioned salon. 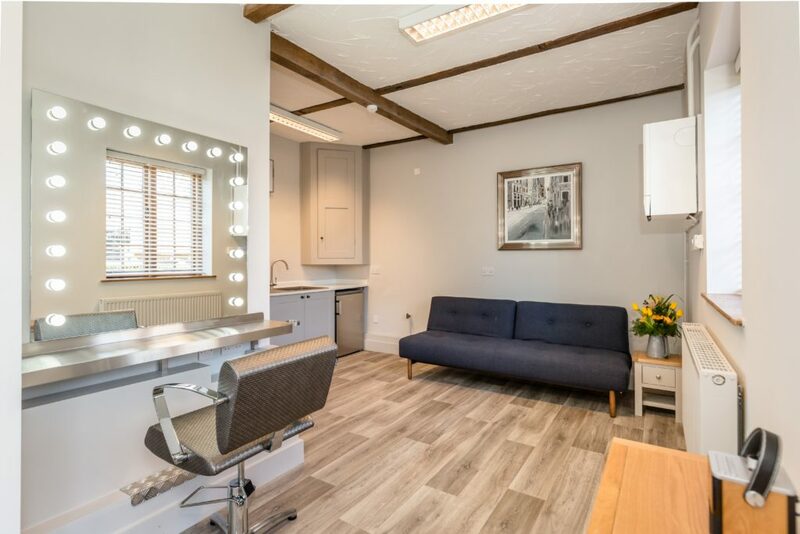 There are hair and make-up stations to perfect those all-important cosmetic touches, a full-length mirror, plus a convenient shower, lounging area and kitchen. 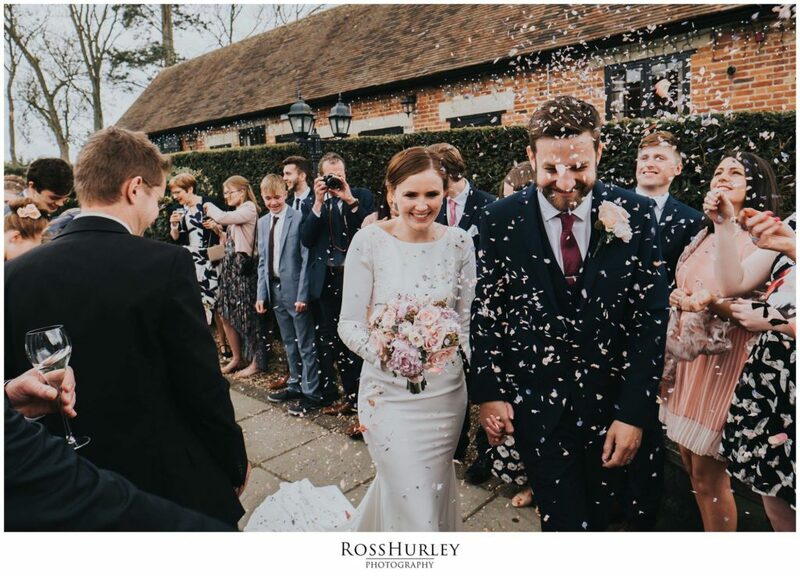 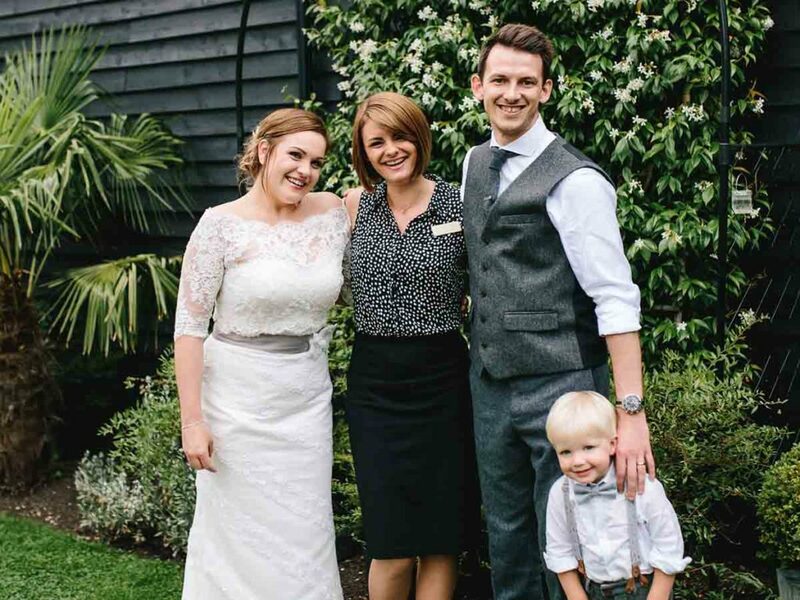 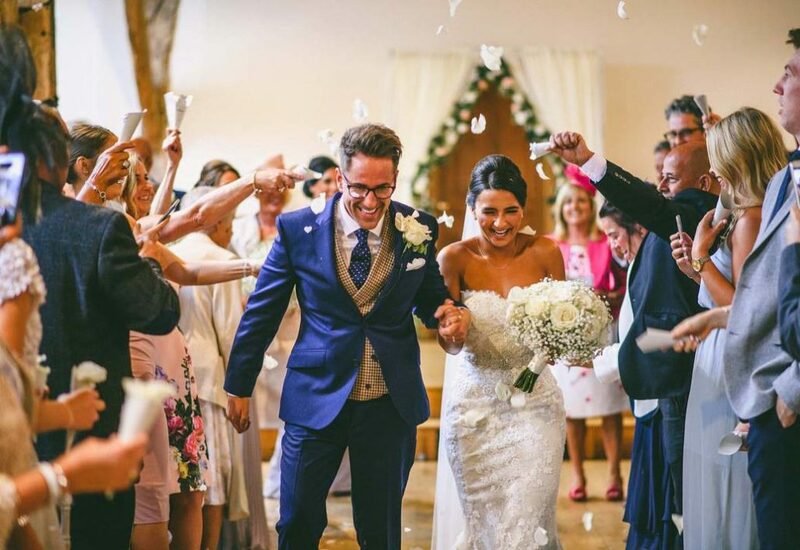 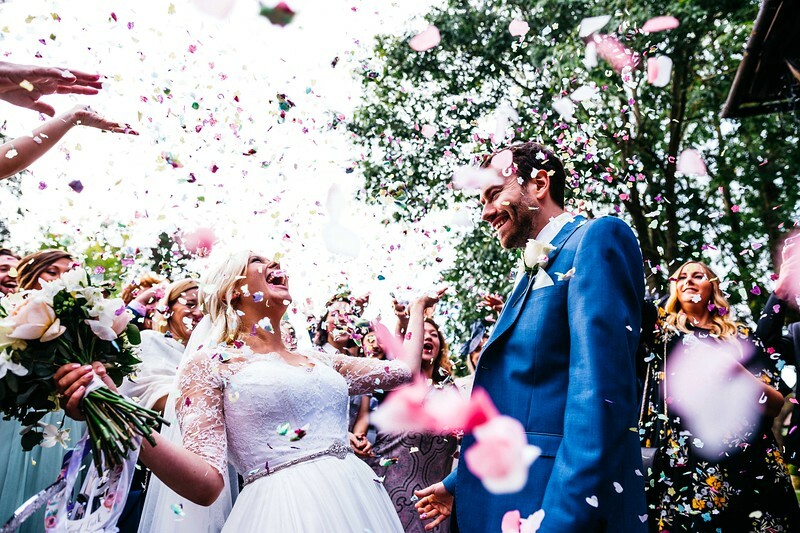 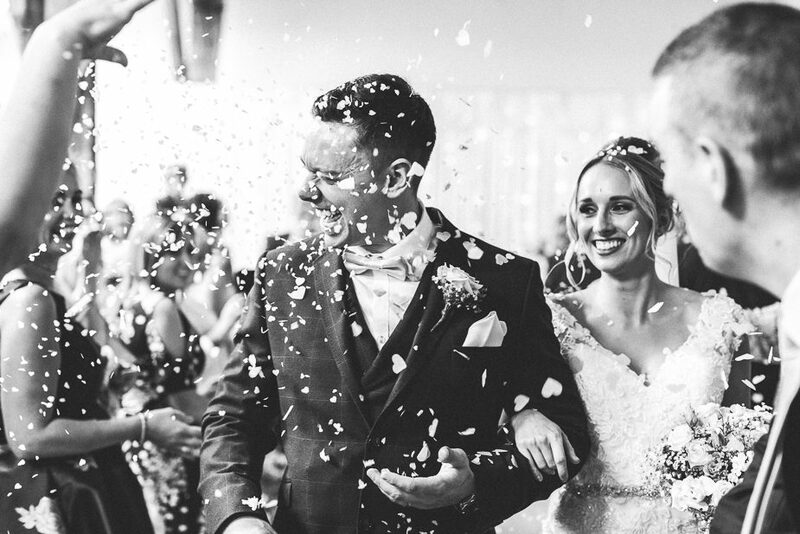 The Registrar and Celebrant will meet you here before your ceremony and you will be accompanied by our wedding co-ordinator to ensure everything runs smoothly. 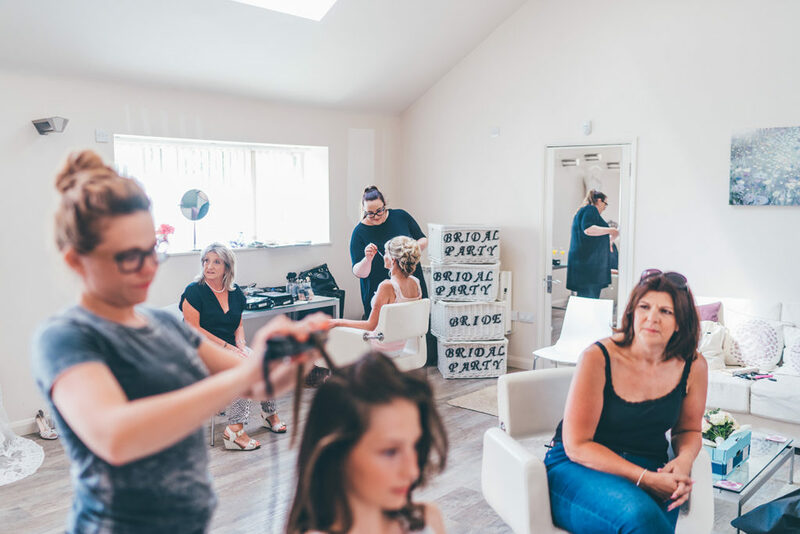 You can bring your own hairdresser and beautician, or we can advise of you of our local recommended stylists. 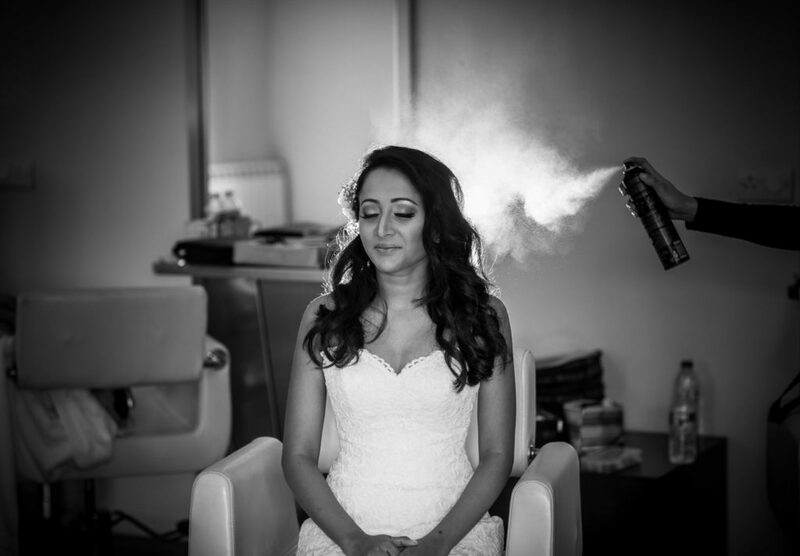 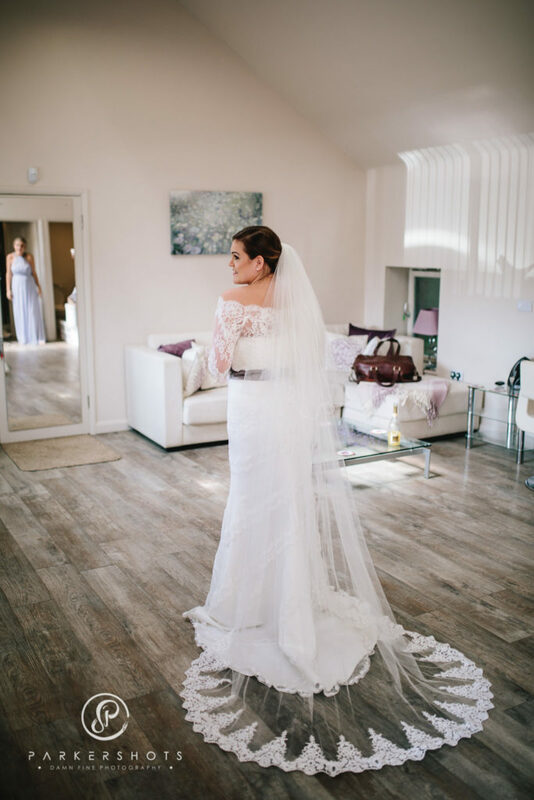 Even if you are having a church wedding you can still get ready in our salon and leave from Winters Barns. 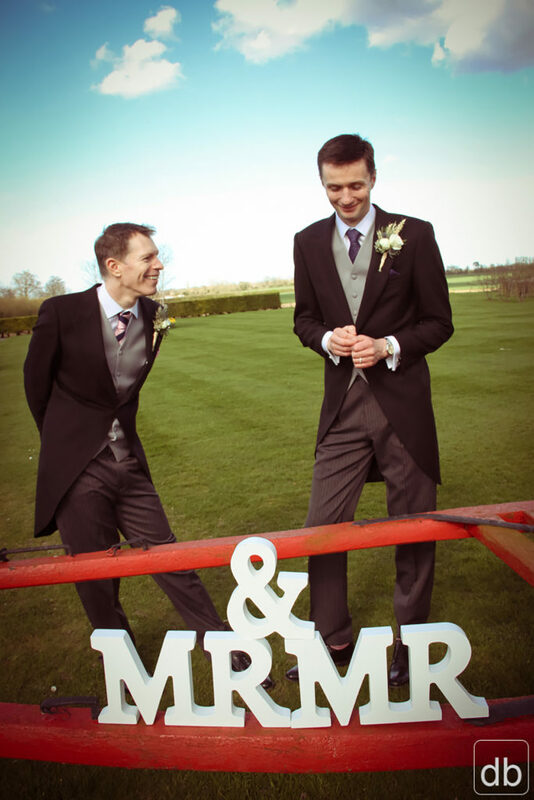 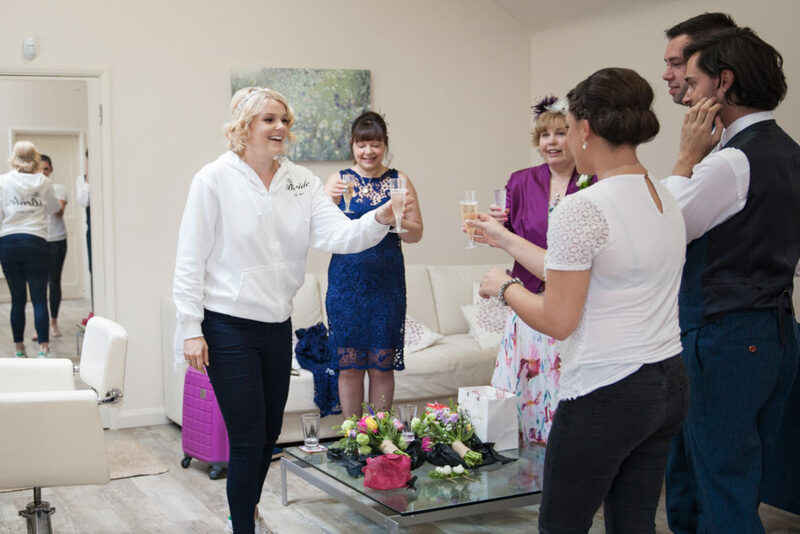 Not forgetting the groom, we have a second dressing room where the groom and groomsmen can get suited and booted before stepping out in style ready for the wedding. 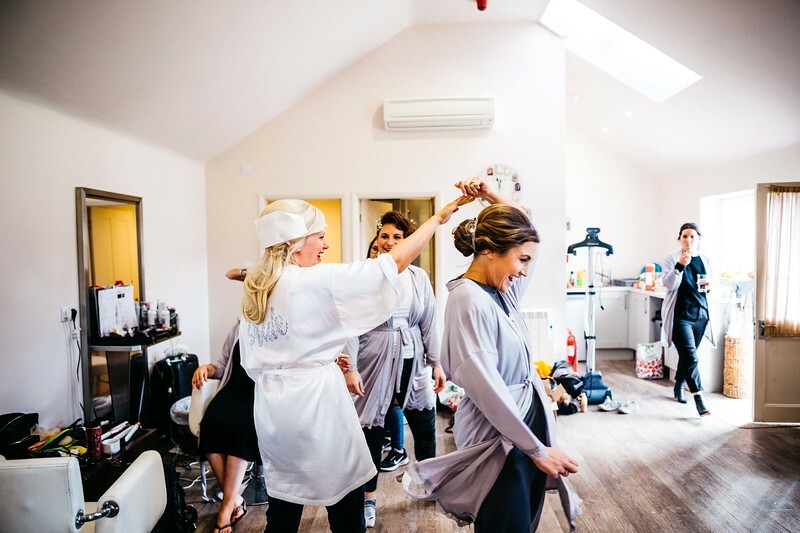 Facilities include a changing room with en suite, styling station, full-length mirror, hospitality area and lounge. 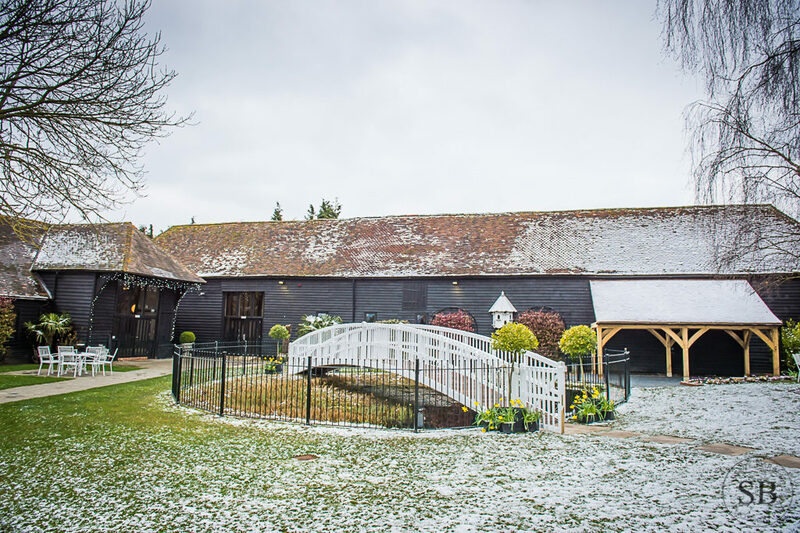 Winters Barns has two stunning locations for your ceremony. 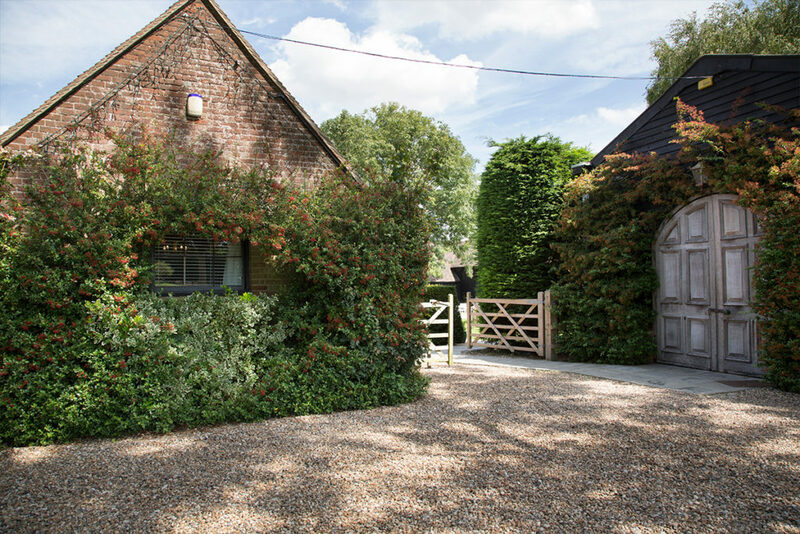 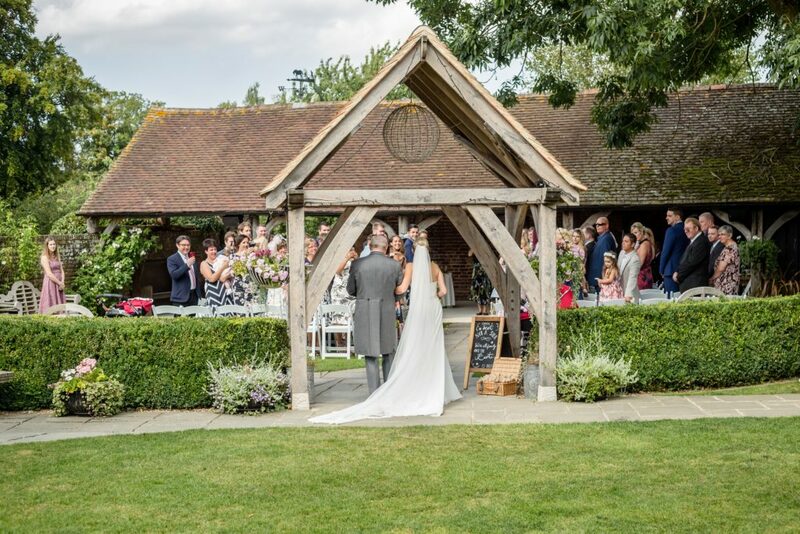 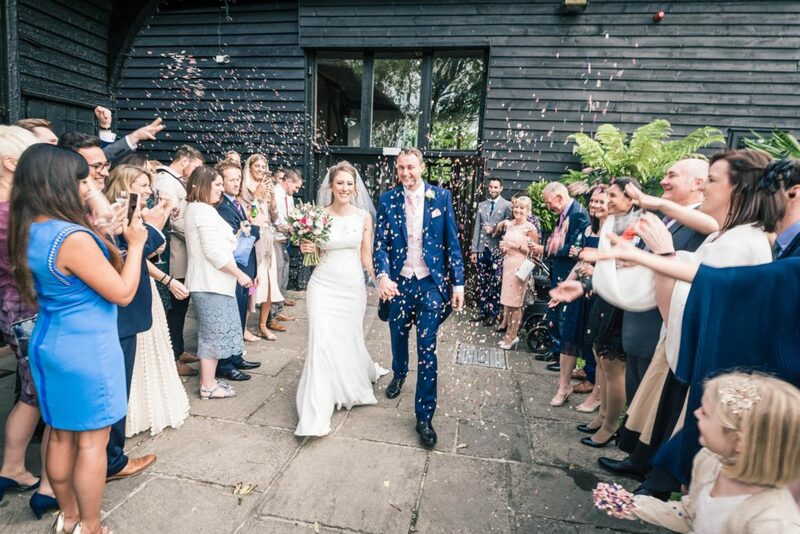 Alongside our wonderful Kentish gardens, with attractive courtyard and traditional wedding arch, we have our beautiful open sided Cart Barn. 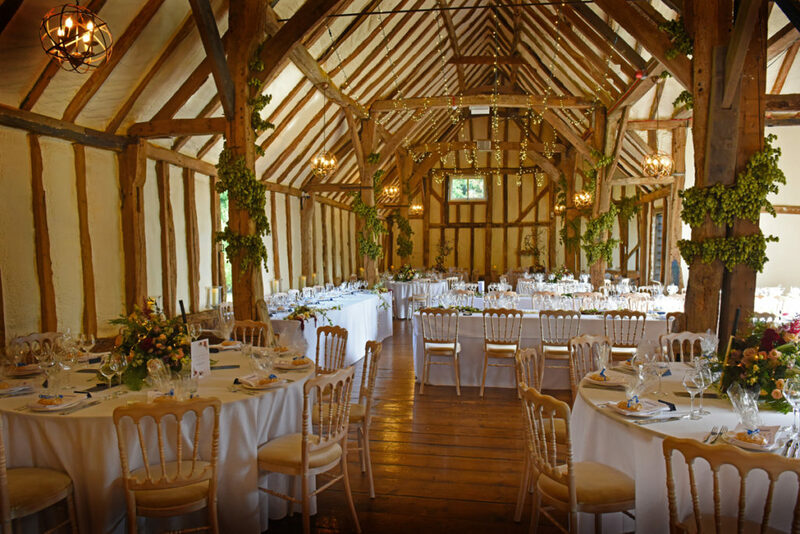 Inside there is the oak beamed Ceremony Room which dates to 1750. 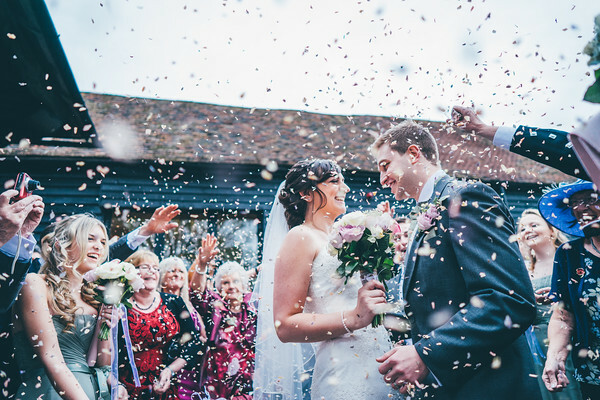 Winters Barns is a place where special memories are easily made. 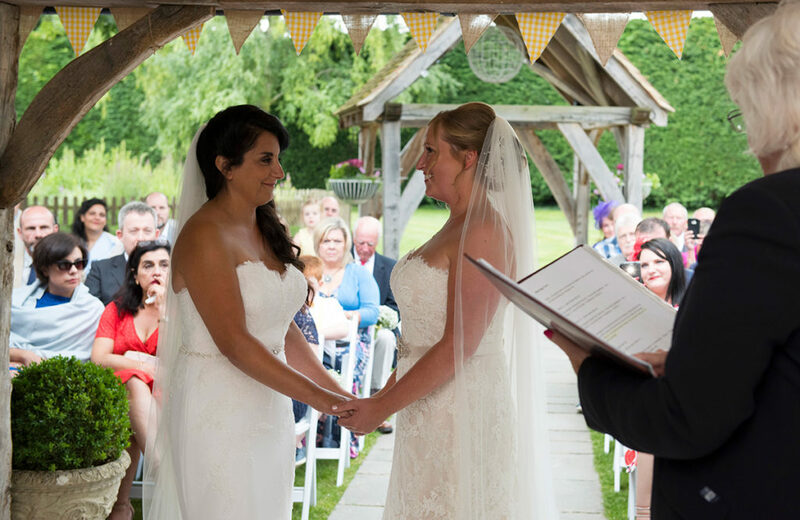 We will even book your Celebrant and Registrar for you with the Ceremonies Team from Kent County Council. 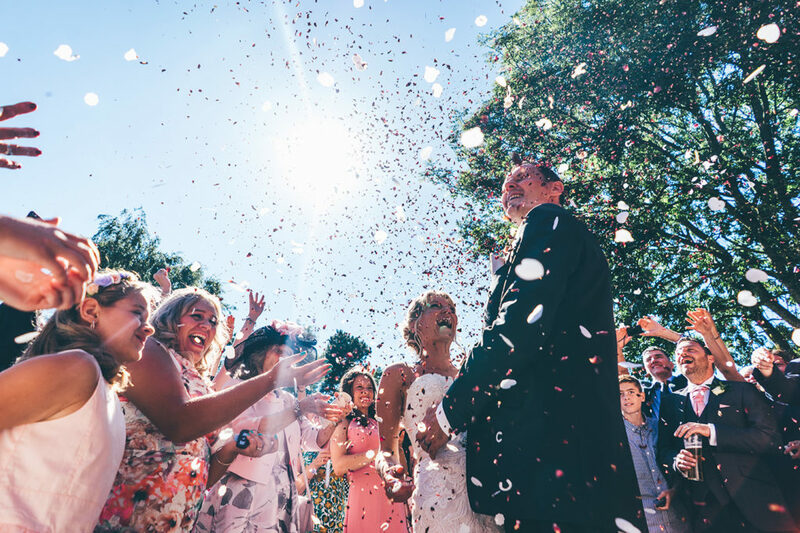 Alternatively, if you wish to have a church ceremony we have two local churches, in Nackington and Lower Hardres. 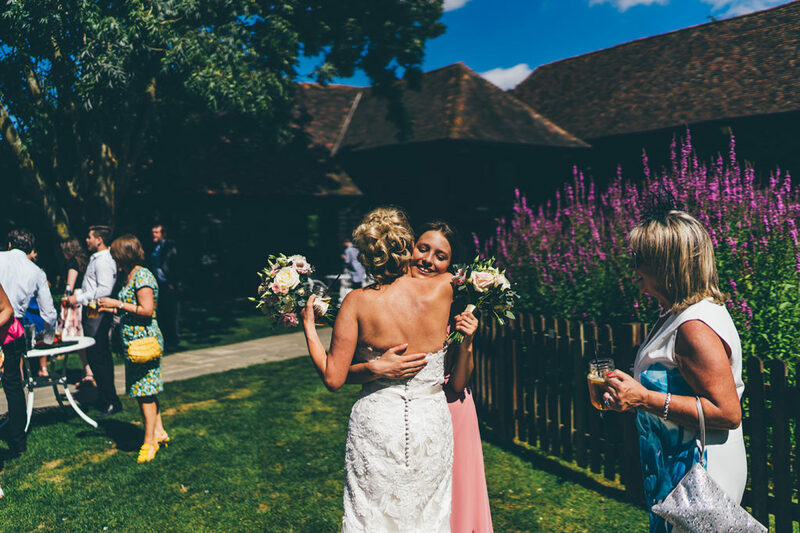 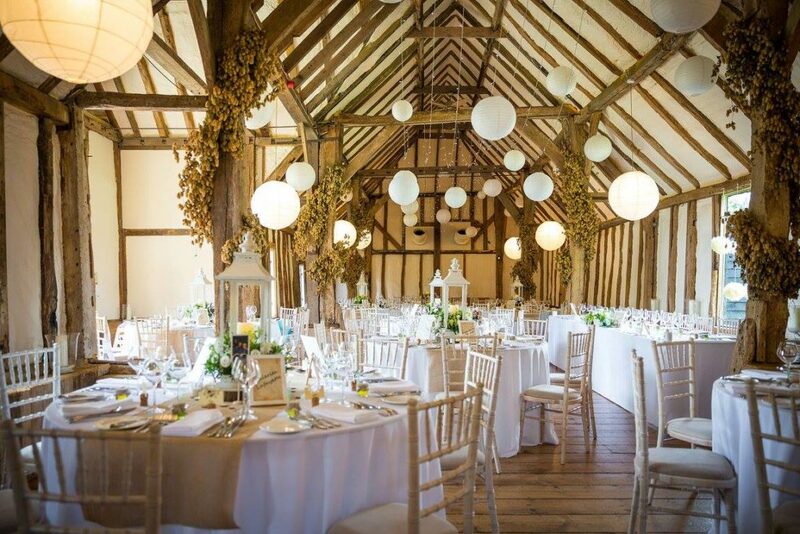 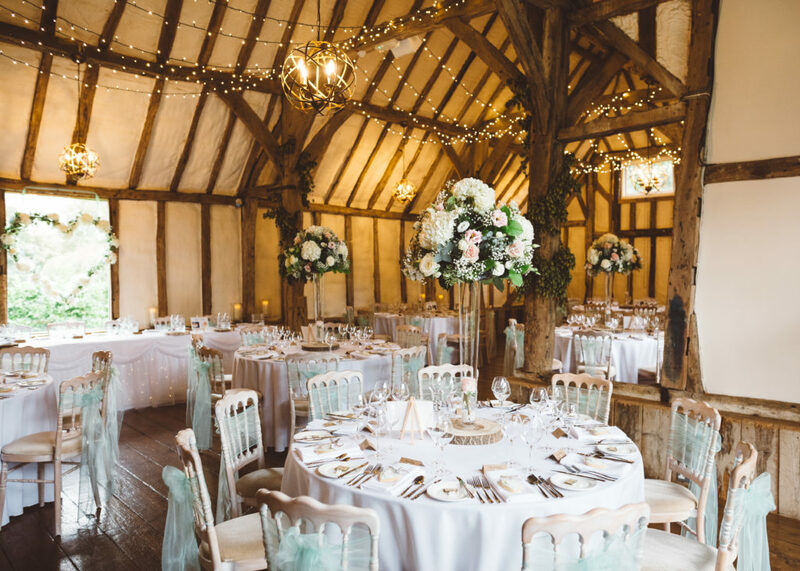 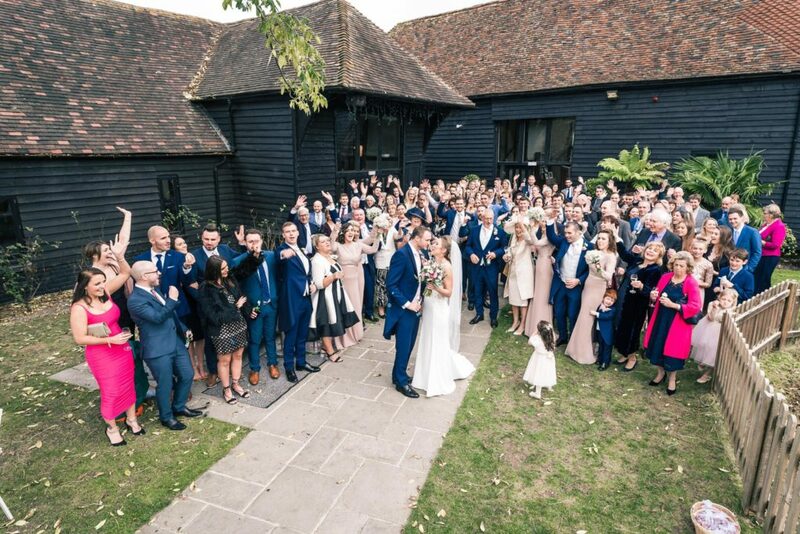 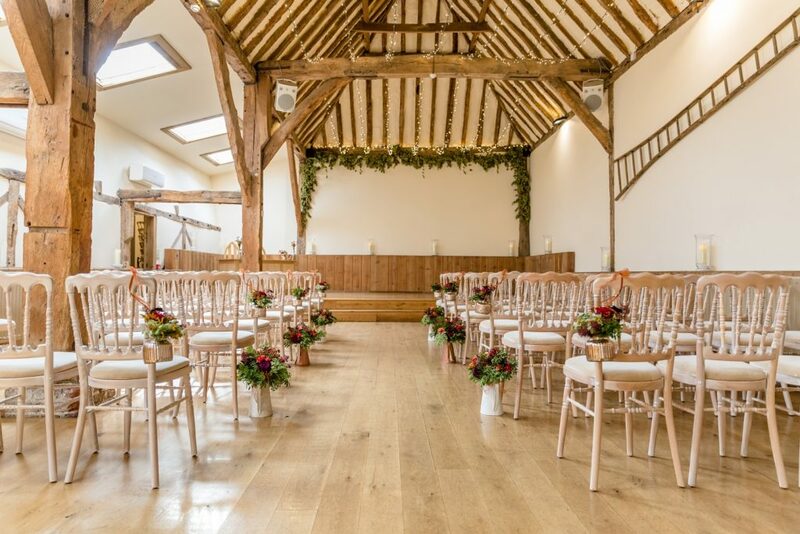 Inside ceremonies are in the lovely oak beamed but light and airy 1750 Kentish barn – fully heated and air conditioned. 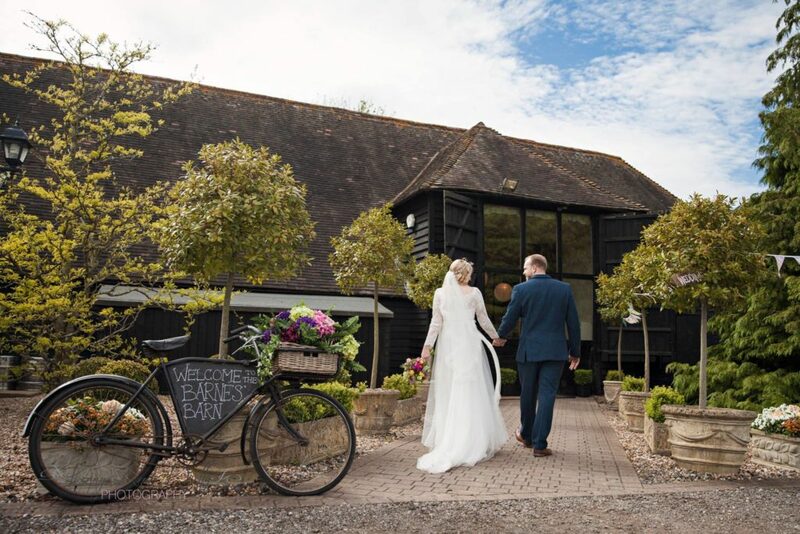 Outside ceremonies are in the beautiful open sided Cart Barn, approached by the oak wedding arch. 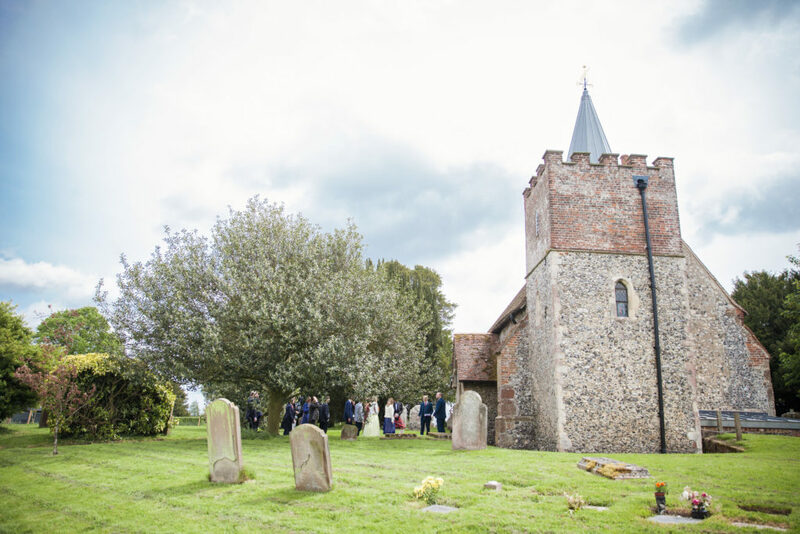 For a church wedding, there are two pretty country parish churches nearby, and of course several churches in Canterbury, including the Cathedral. 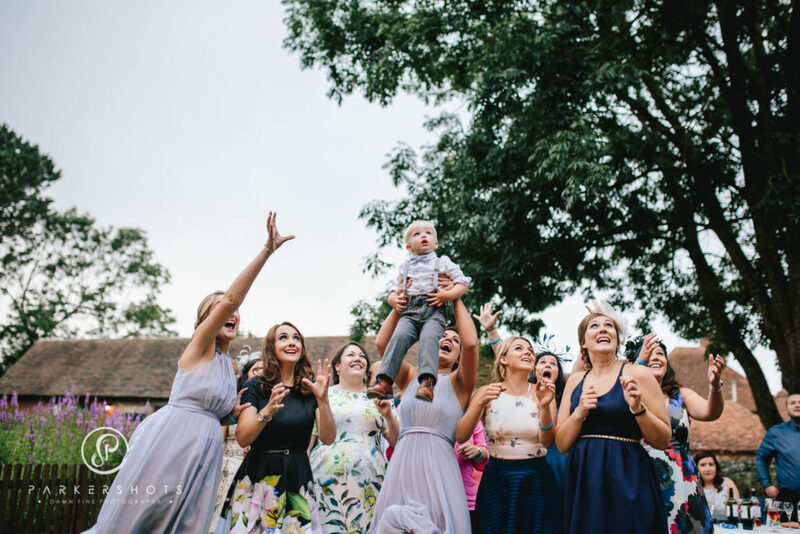 These traditions can enhance the day and create fantastic photo opportunities. 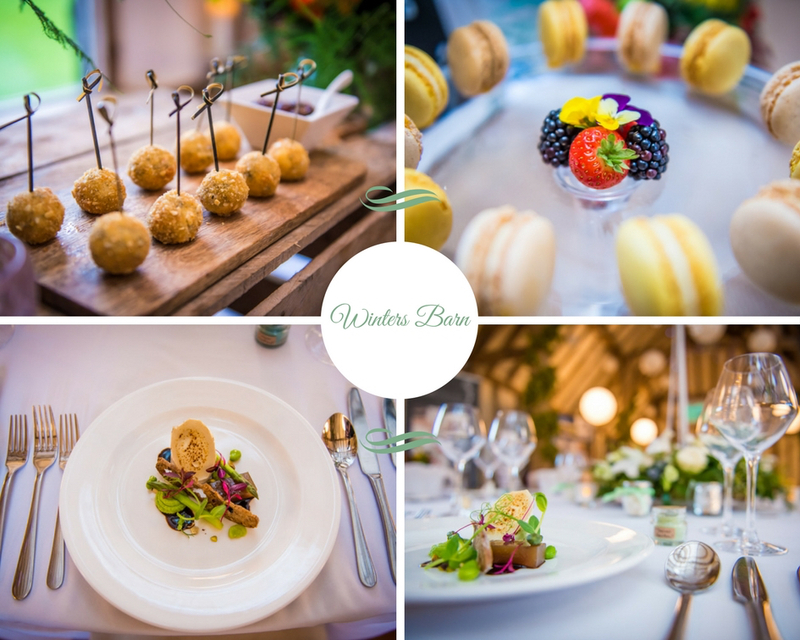 Our wedding co-ordinator will orchestrate these if you wish. 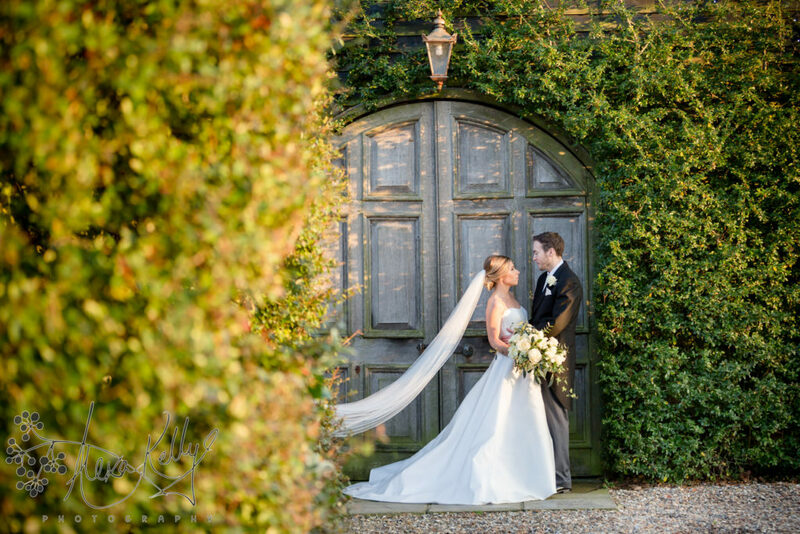 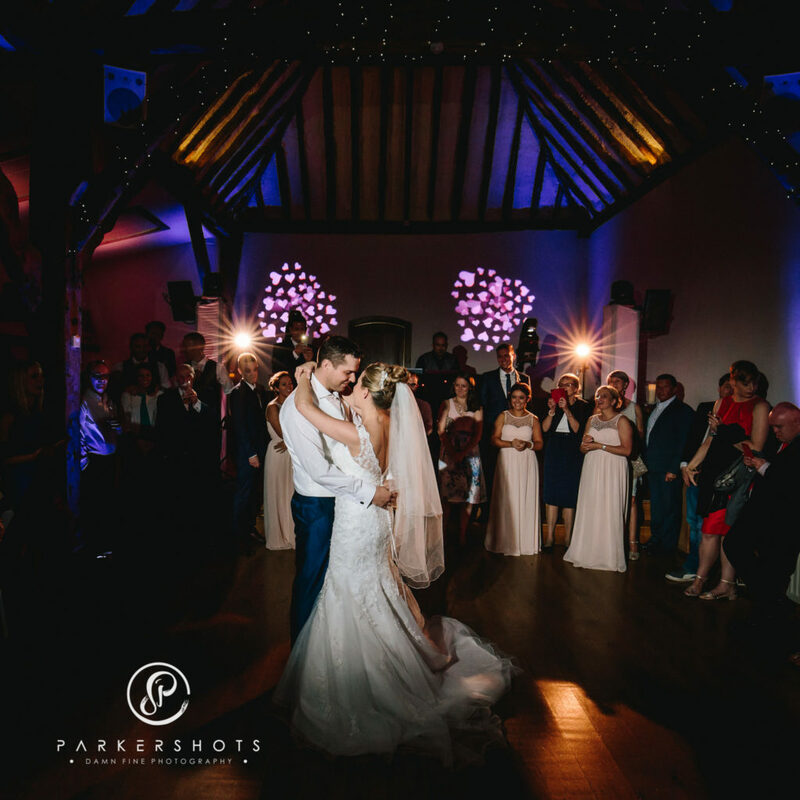 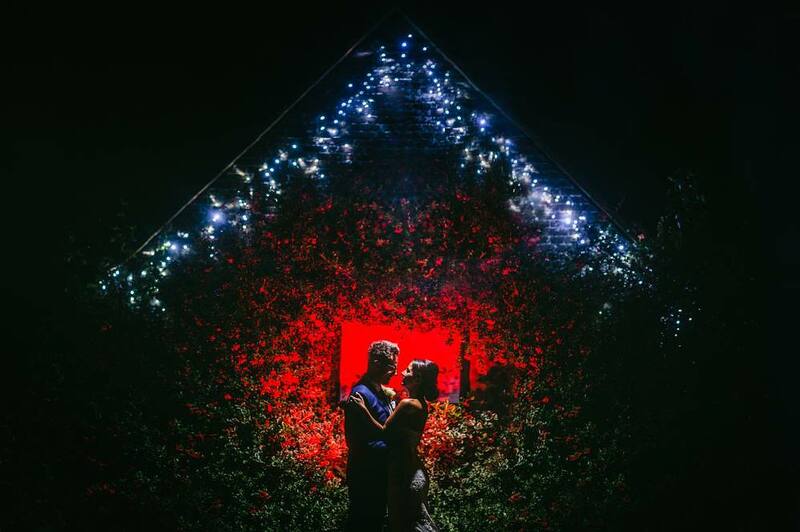 At Winters Barns, there are endless photo opportunities, inside and outside, it truly is a venue for all seasons. 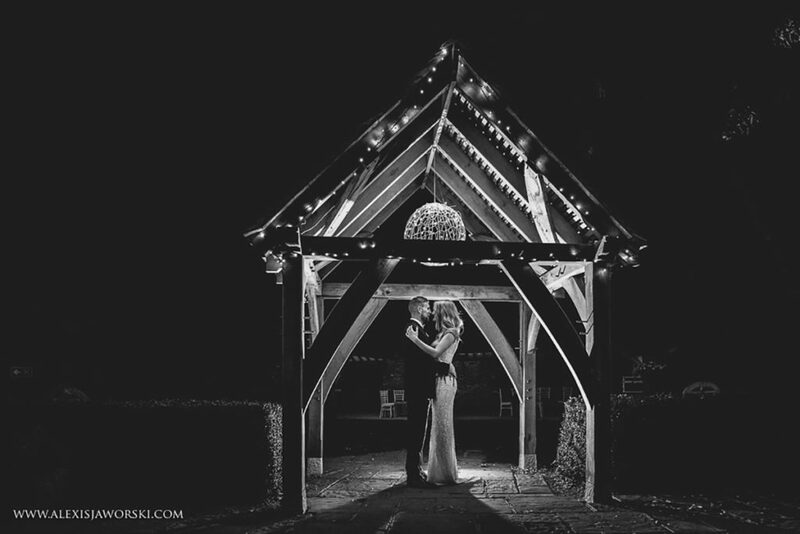 At night, the gardens and beamed oak structures are illuminated magically. 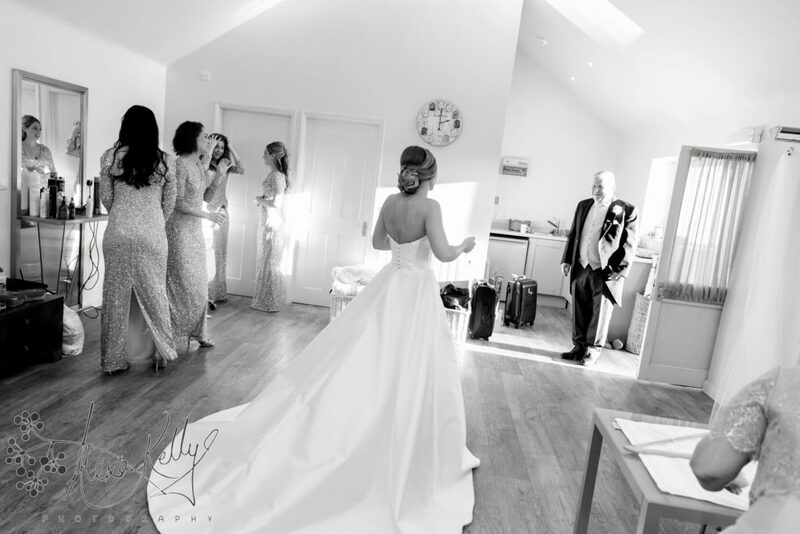 See the galleries, videos and virtual tours on our website and follow our current weddings on Facebook. 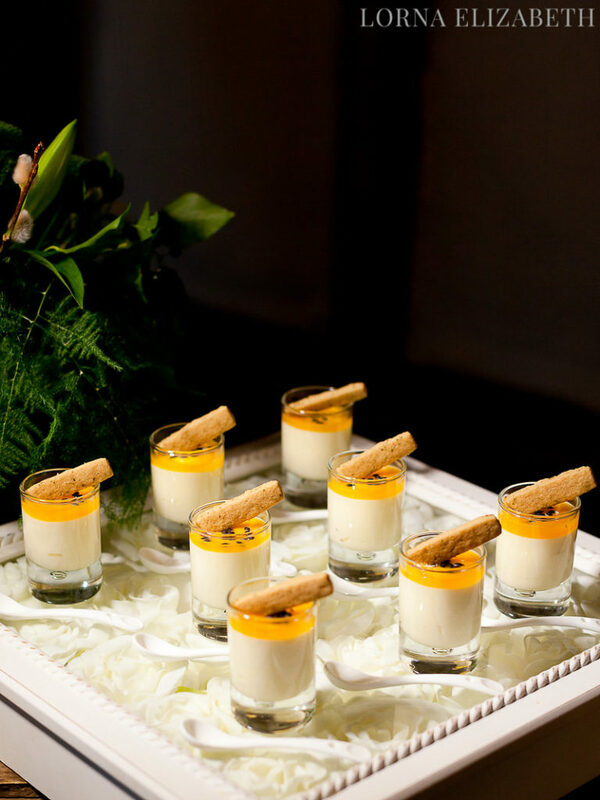 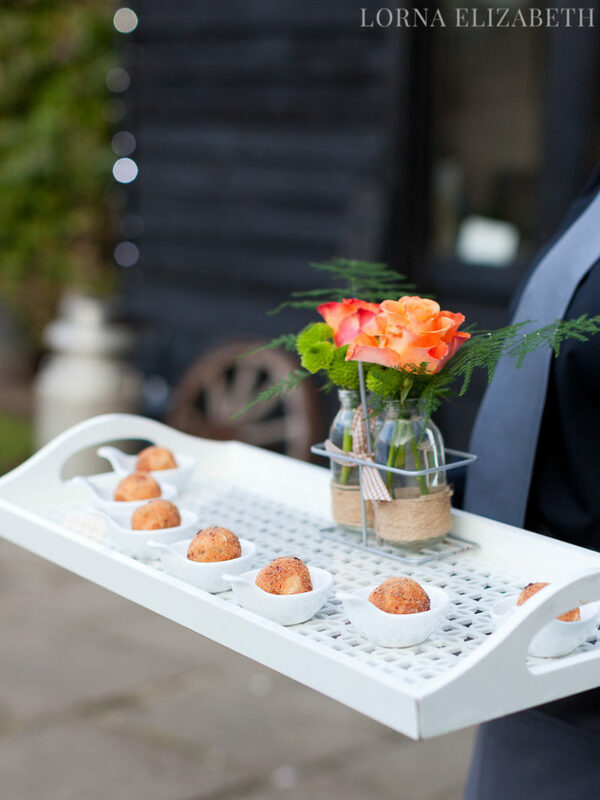 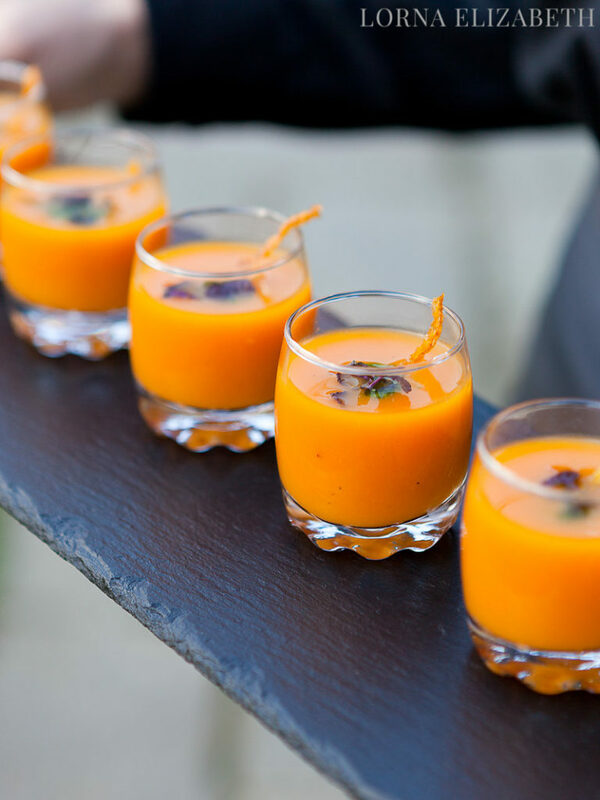 After your ceremony at Winters Barns, or after returning from church, you will be greeted by tray service drinks and canapés. 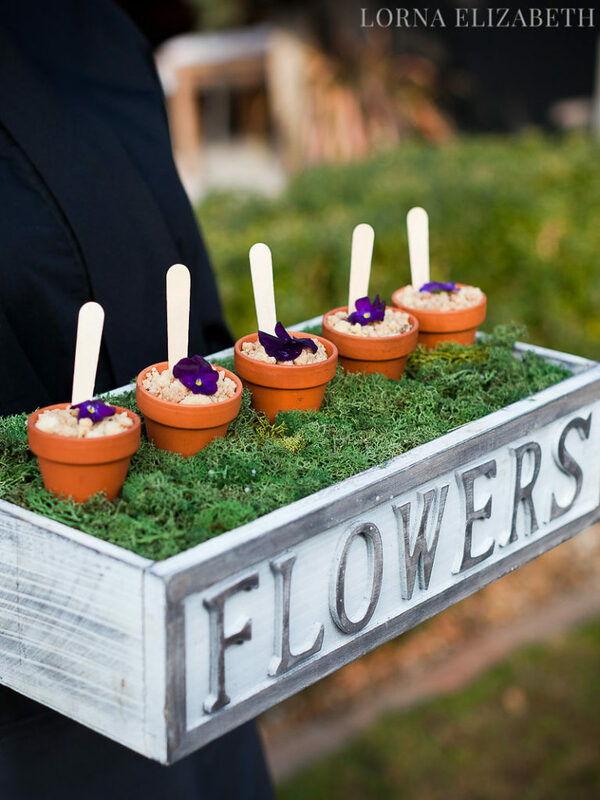 These may be served either indoors or outdoors according to your preference and of course the season. 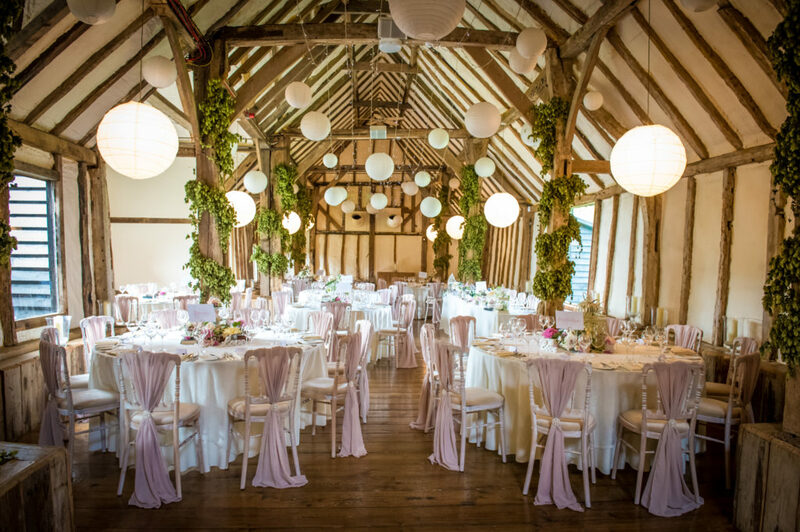 The defining feature of our marvellous barns is their vaulted, beamed ceilings. 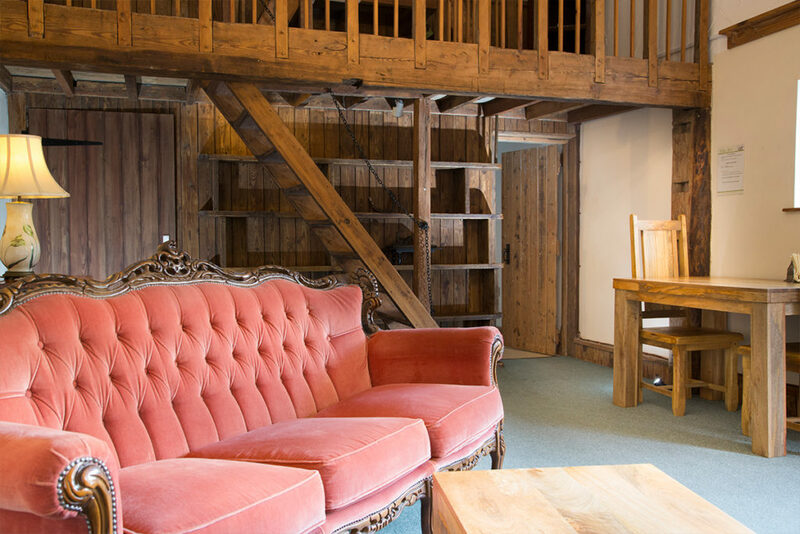 Dating back to 1660, these original wooden features create a warm and romantic atmosphere reminiscent of folk and fairy-tales. 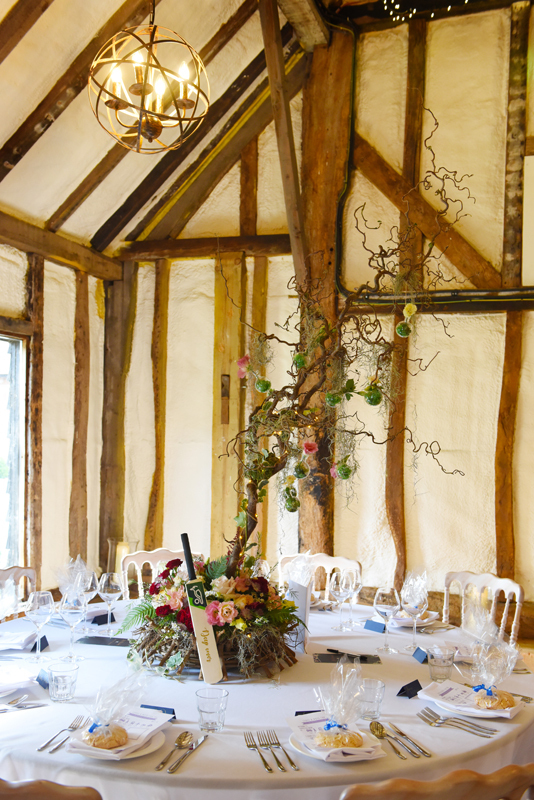 The space is also flexible and can be decorated to fit your wedding theme. 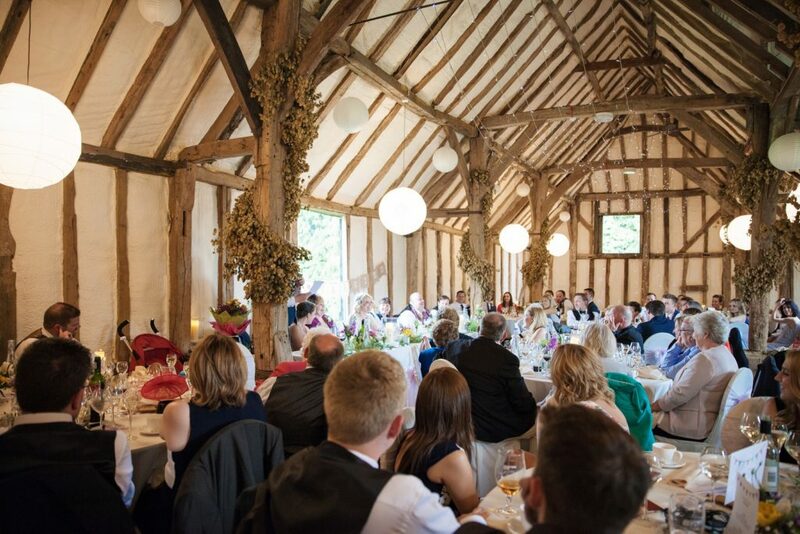 The wedding breakfast is served in the most historic part of the barn. 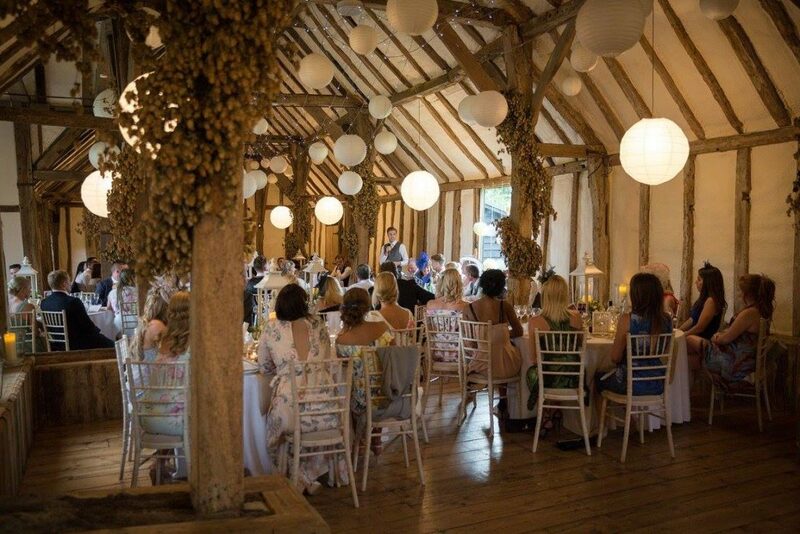 Here up to 150 can sit comfortably in a beautiful original oak framed 1660 barn, which is light and airy and a beautiful space day and night. 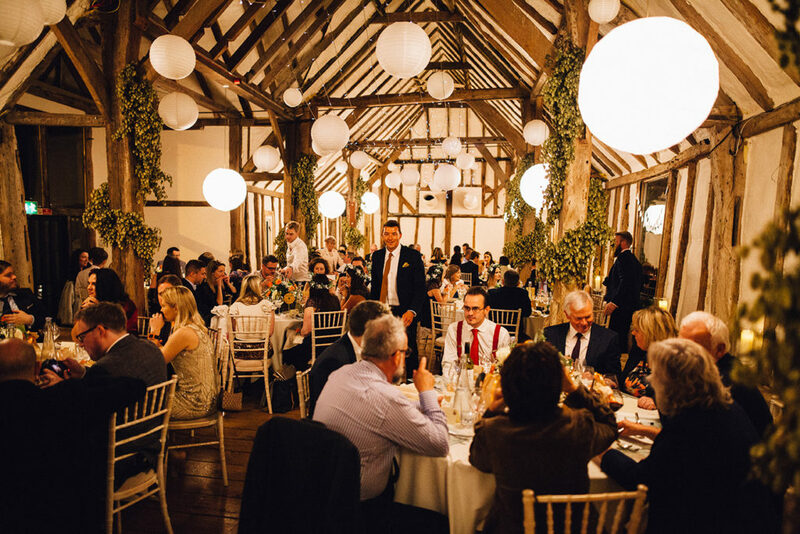 We can cater for small or large receptions, with either banquet or round tables of different sizes to match your numbers. 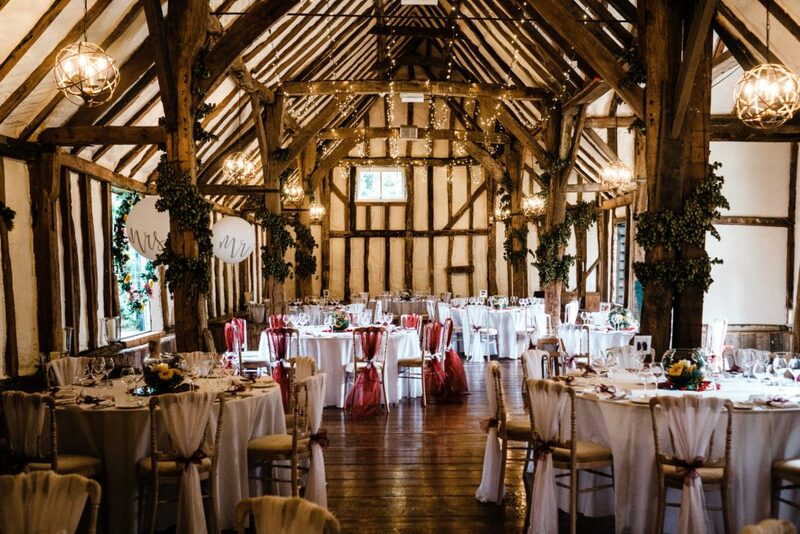 Because our barns are linked together, the venue has a spacious and open-plan feel. 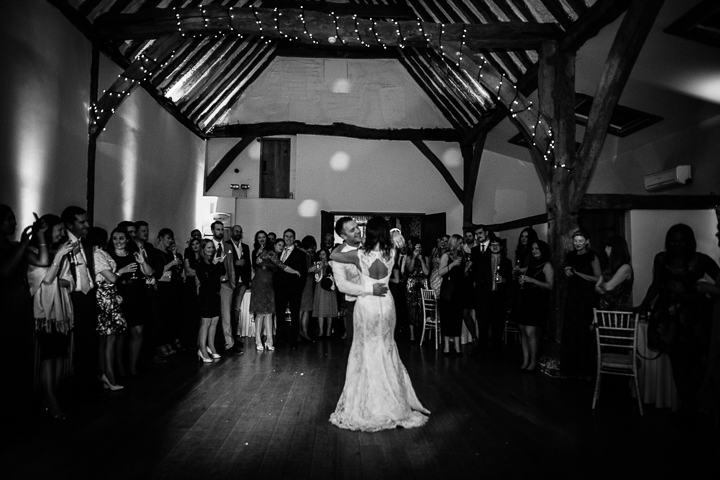 Guests can move between the 1660 barn, bar area and ceremony room easily without venturing outside. 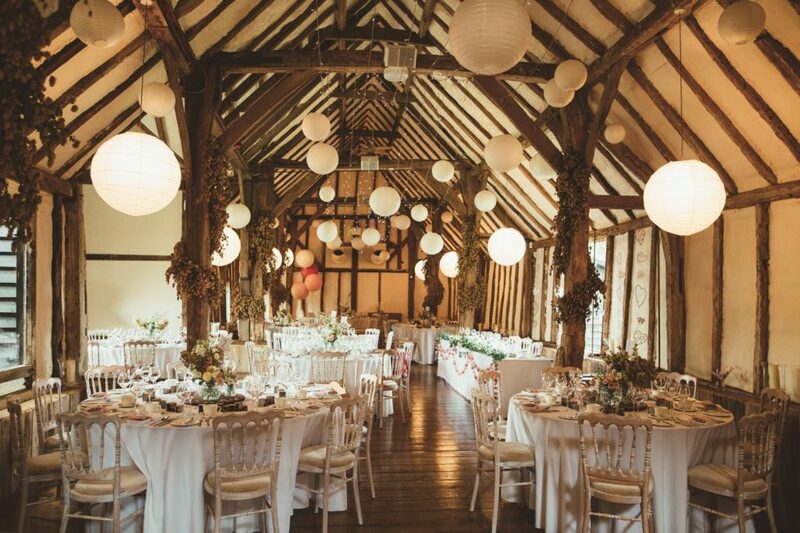 Or they can stay at their table throughout and still feel part of the wedding. 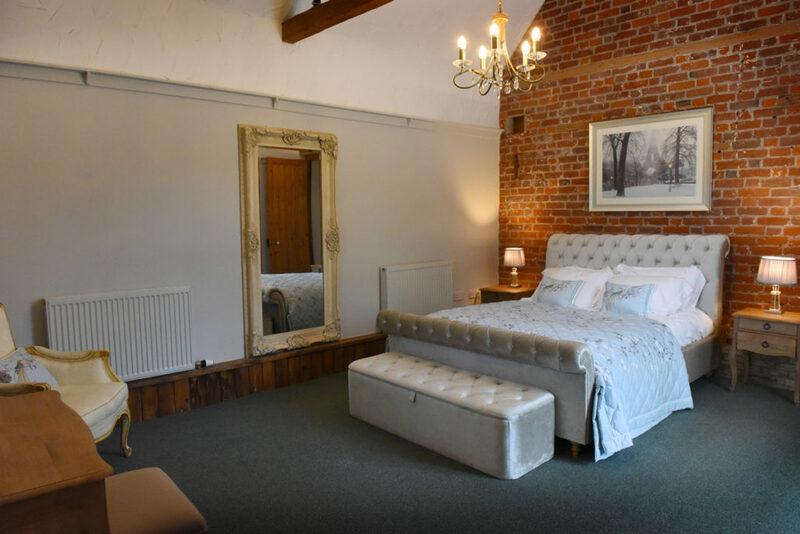 All the amenities are on the ground floor so nobody has to move far. 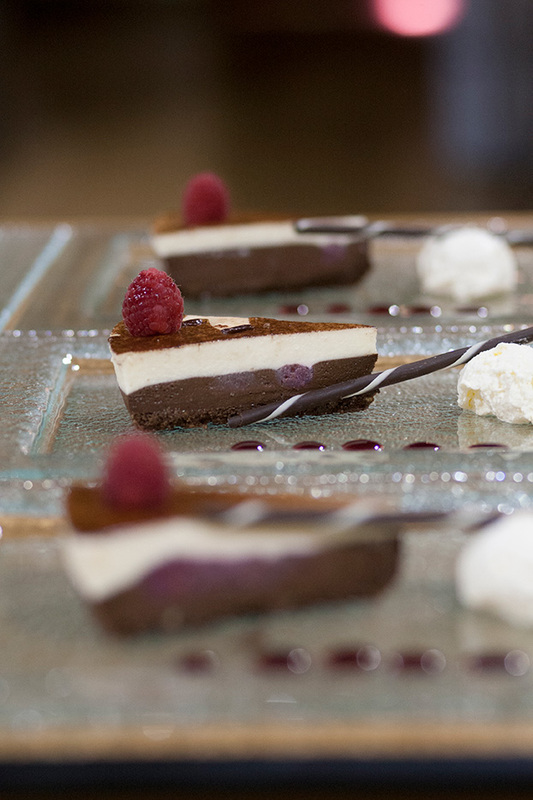 Our aim is that you and your guests are wowed by the quality of our food and service. 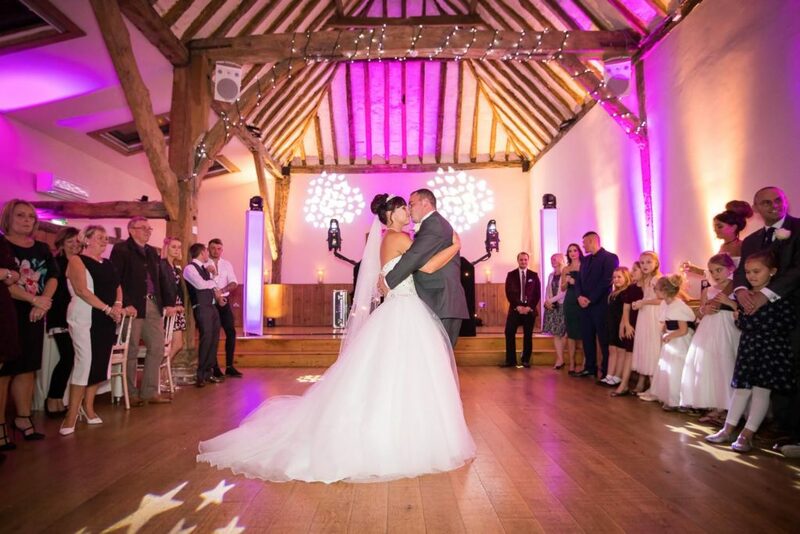 Our wedding menus are provided by Scott Anderson Ltd of Brogdale, Faversham. 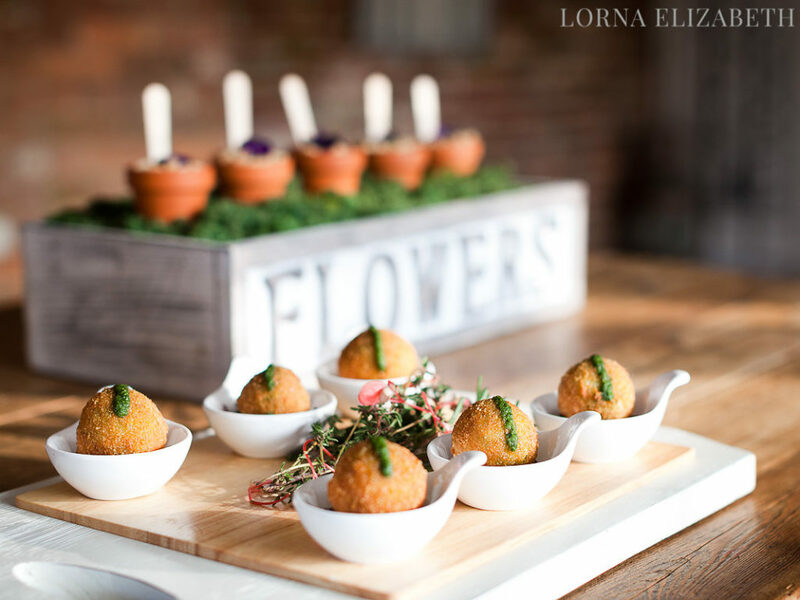 They provide free consultations and complimentary tastings at either Winters Barns or at Brogdale. 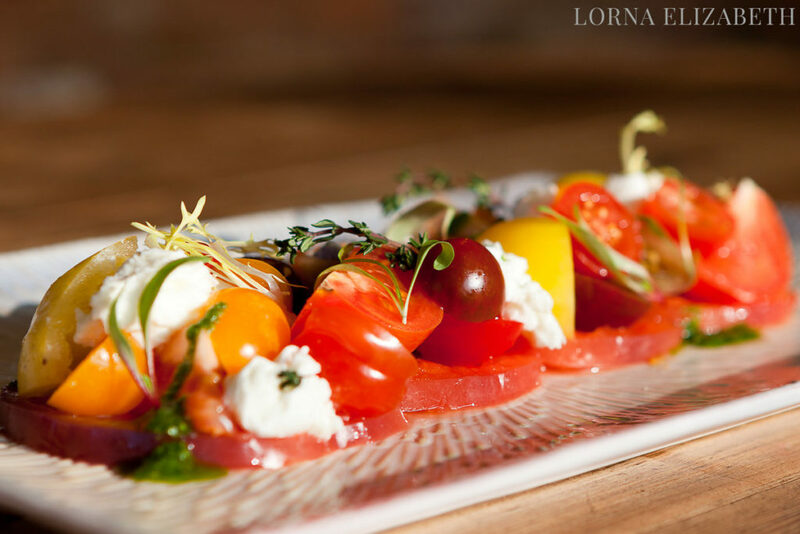 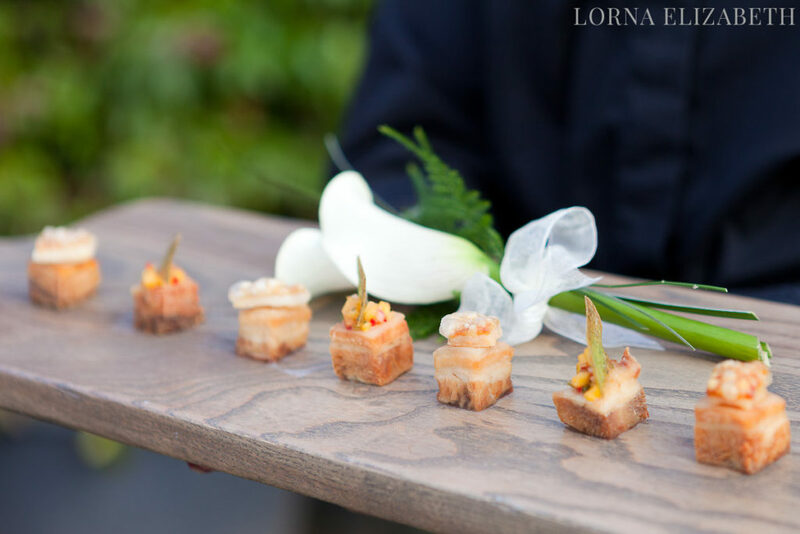 Tasting menus provide a ‘dress rehearsal’ for your special day. 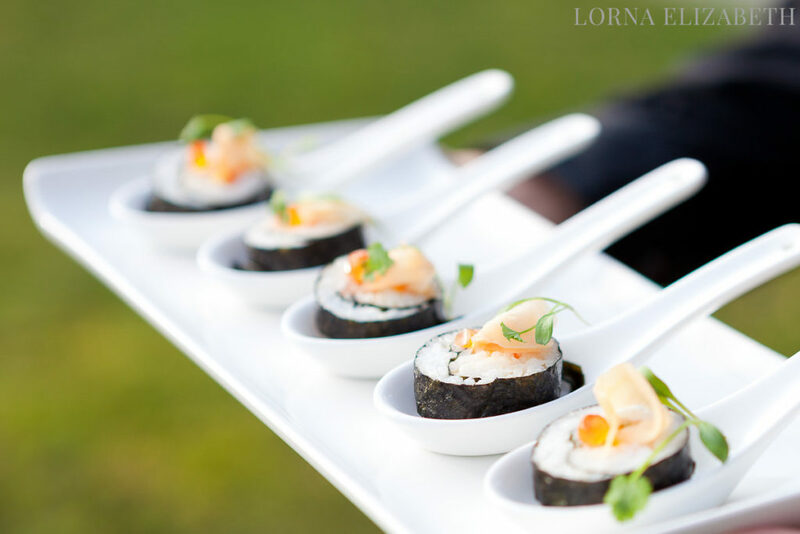 They enable you to sample your chosen menus and to create your overall look. 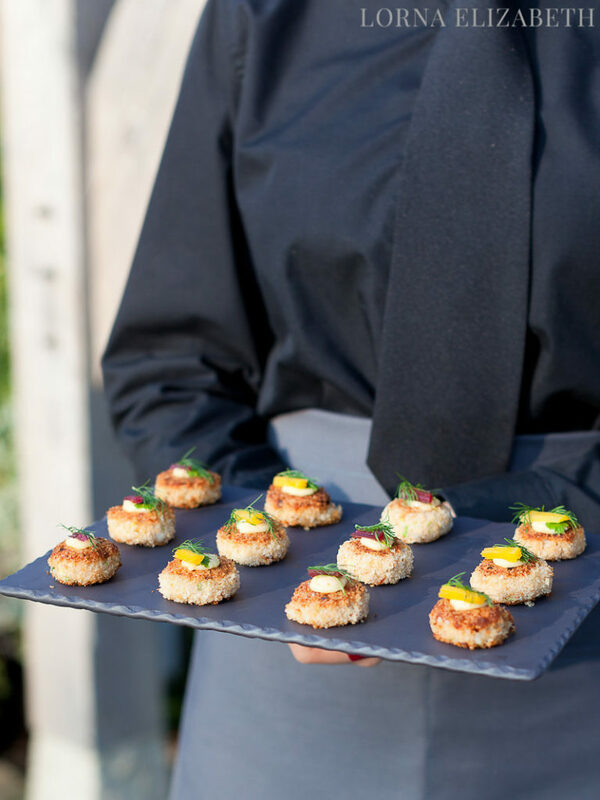 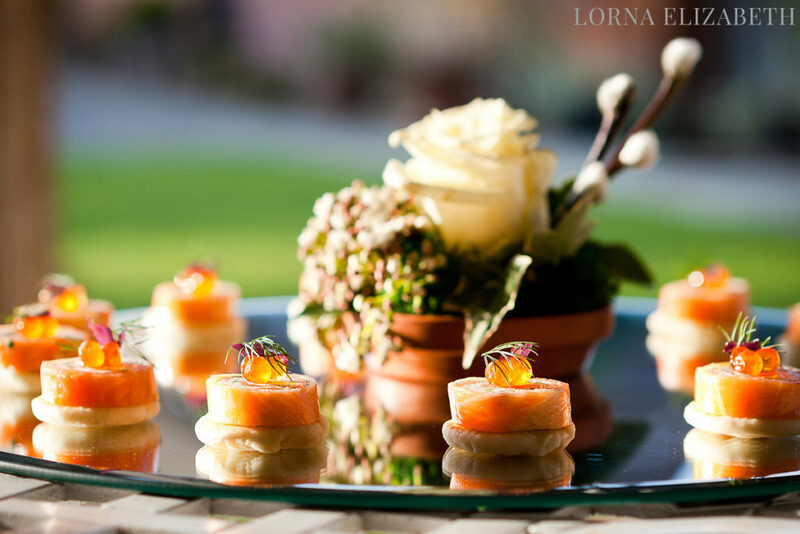 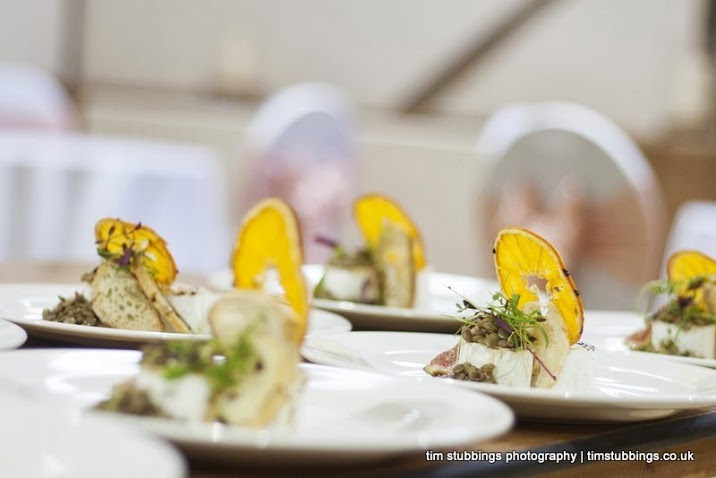 They will talk you through every aspect of your wedding catering to ensure nothing has been overlooked. 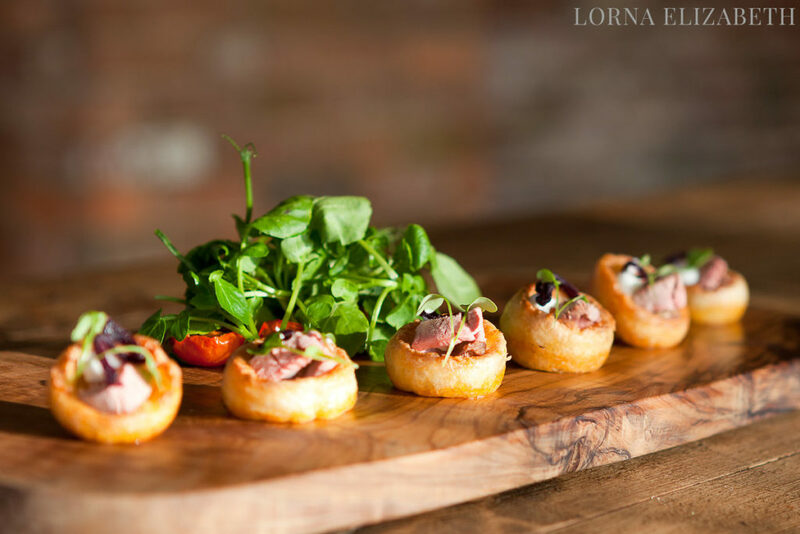 They specialise in catering for any dietary requirements and where possible fresh produce is sourced locally from Kent. 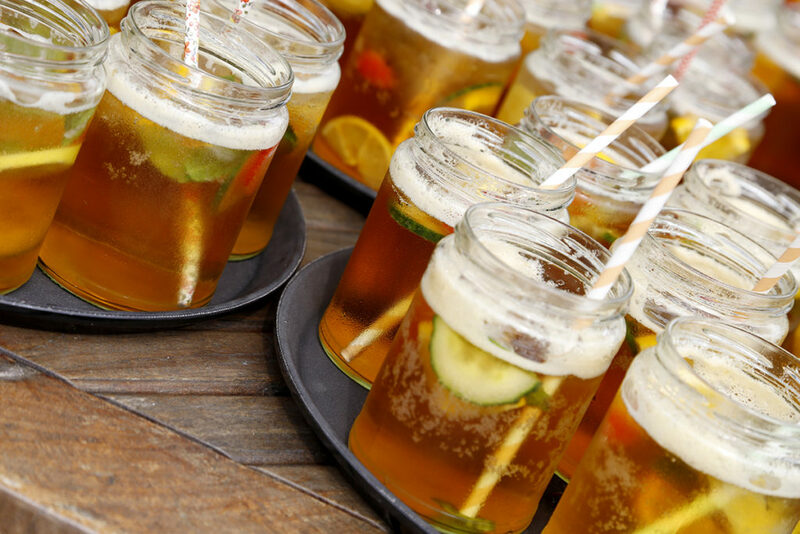 Imagine a refreshing Pimm’s served in the gardens during the summer or a warm mulled cider served indoors on a cold winter’s day. 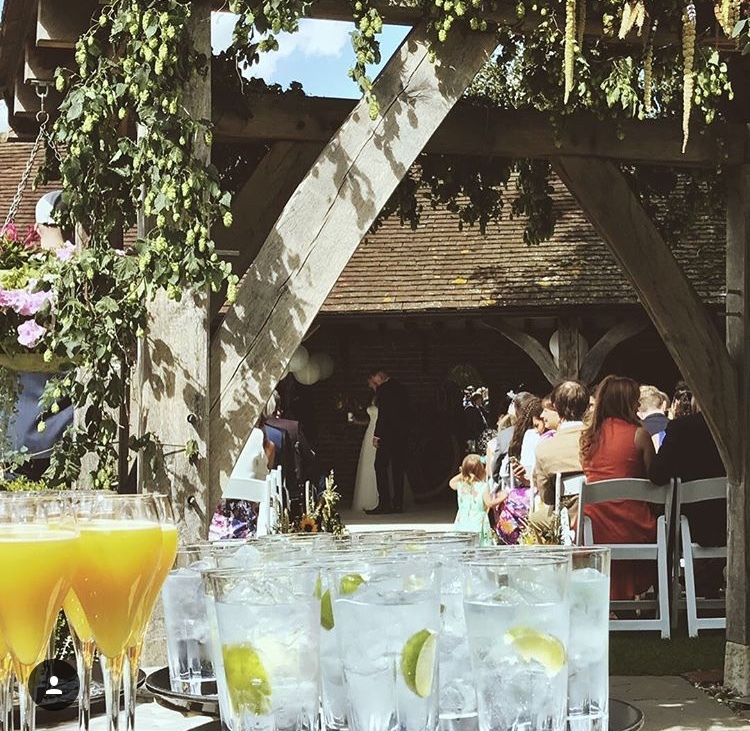 We run a fully stocked and staffed cash bar all day and we include a drinks package within our all-inclusive prices. 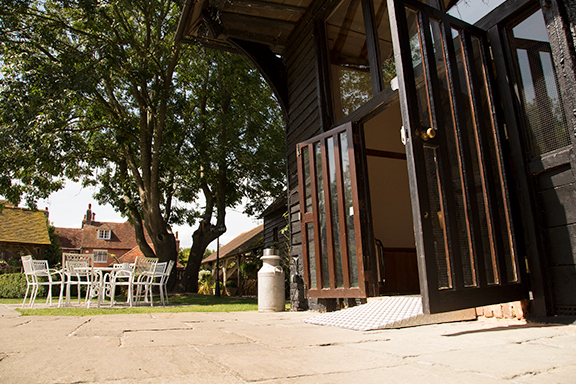 Our English Garden Party option of wines include local award winning Kentish wines. 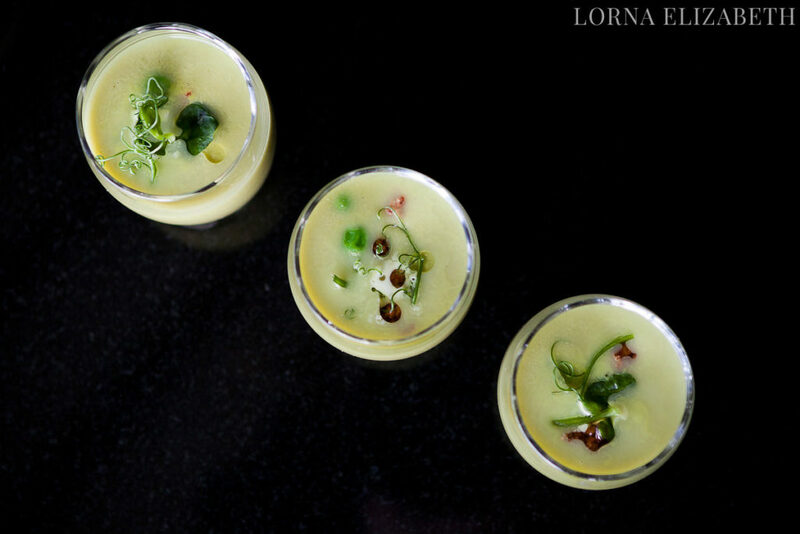 Cocktails including your signature cocktail can be arranged. 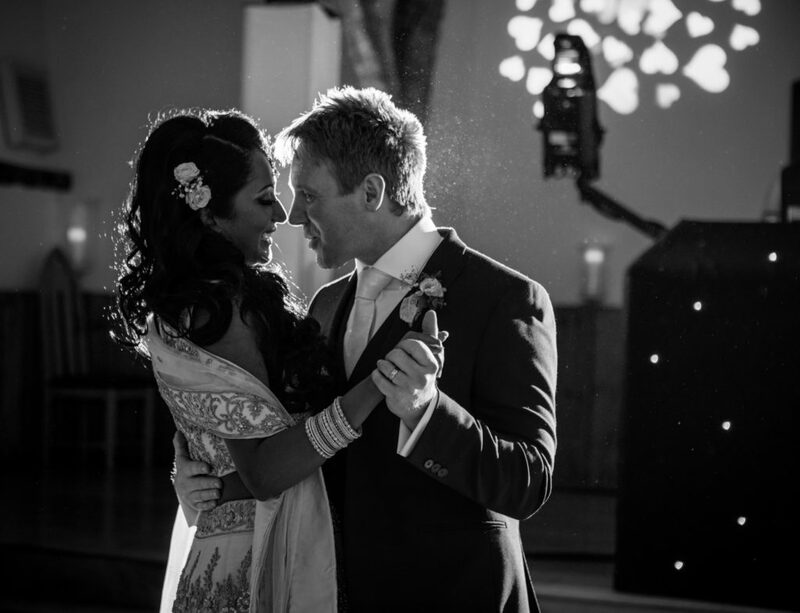 Our licence for alcoholic drinks and amplified music runs to midnight Monday to Saturday. 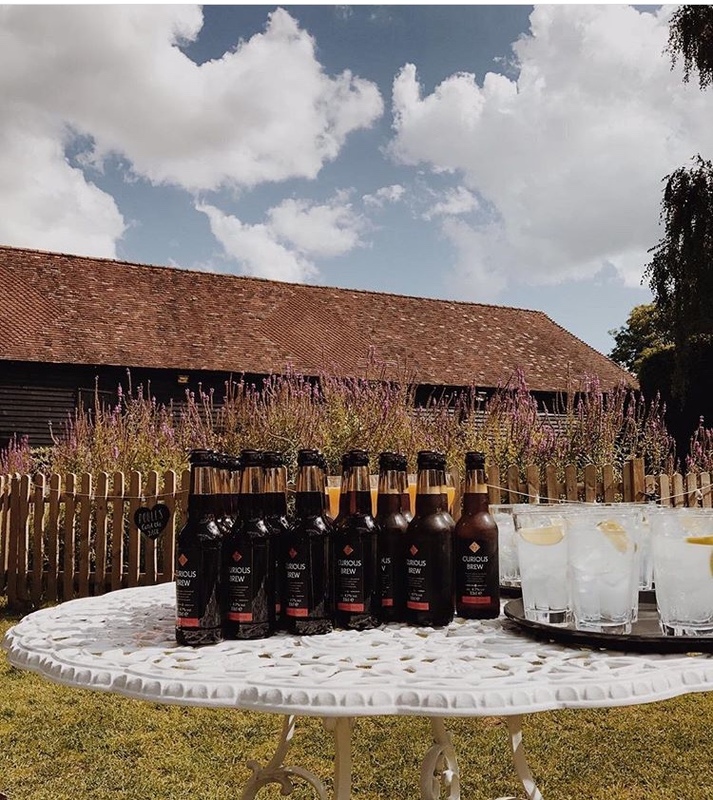 On Sundays, our bar licence runs to midnight but amplified music ceases at 11.00pm, you can still have background music on Sundays until midnight. 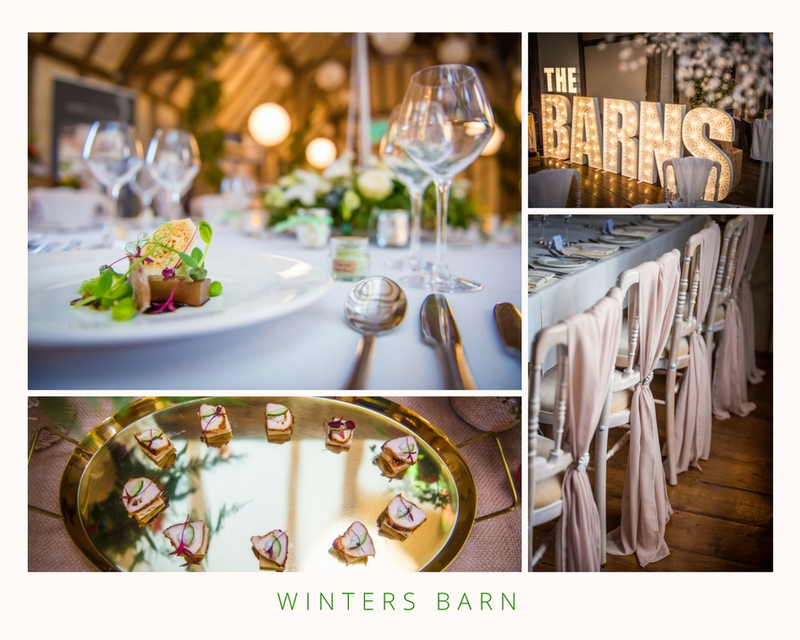 Once your booking has been confirmed with us you will be contacted by the bar to discuss your particular drink requirements and you will be invited to a wine tasting here at Winters Barns. 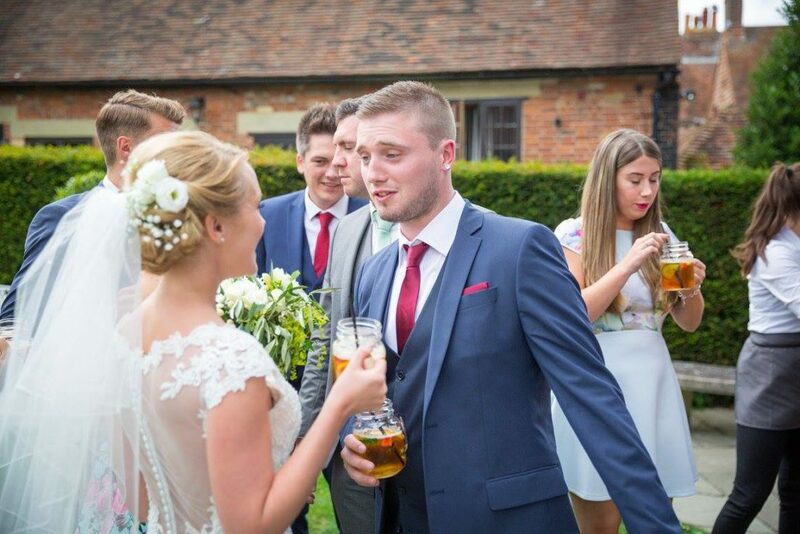 Our bar prices are in line with average Canterbury pub prices. 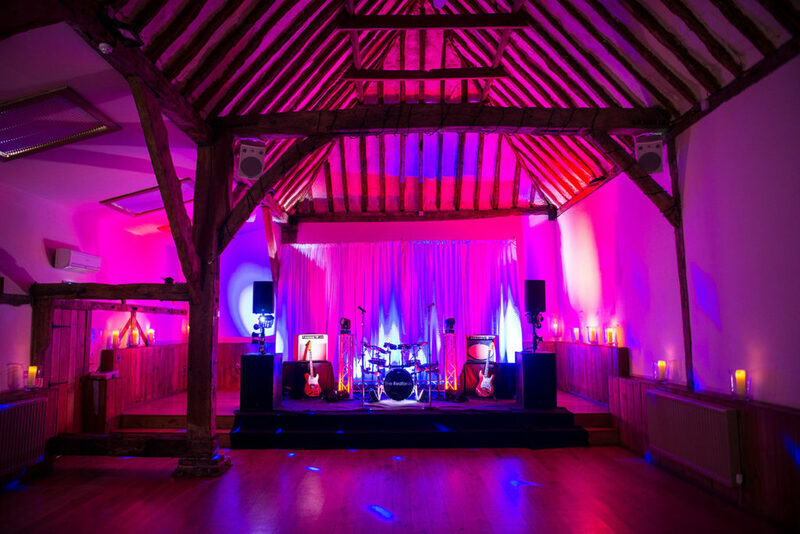 Our 1750’s area of the barns becomes the dancefloor for the evening. 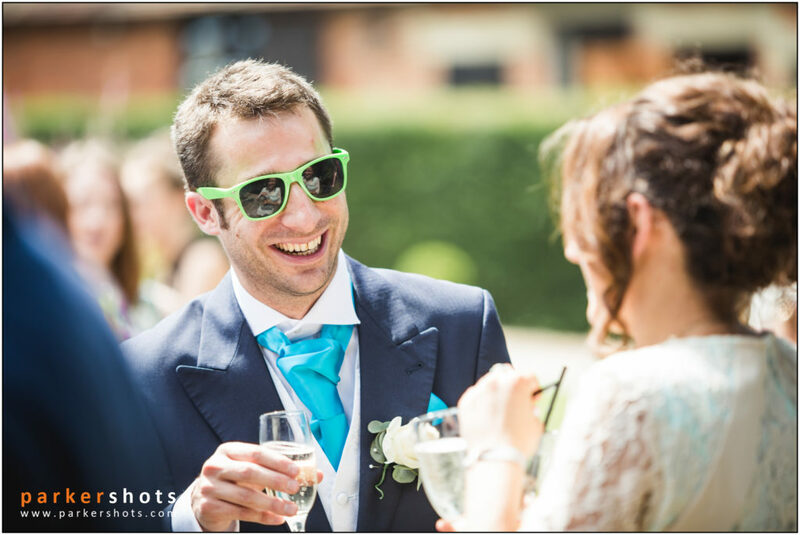 The mood changes and the party begins. 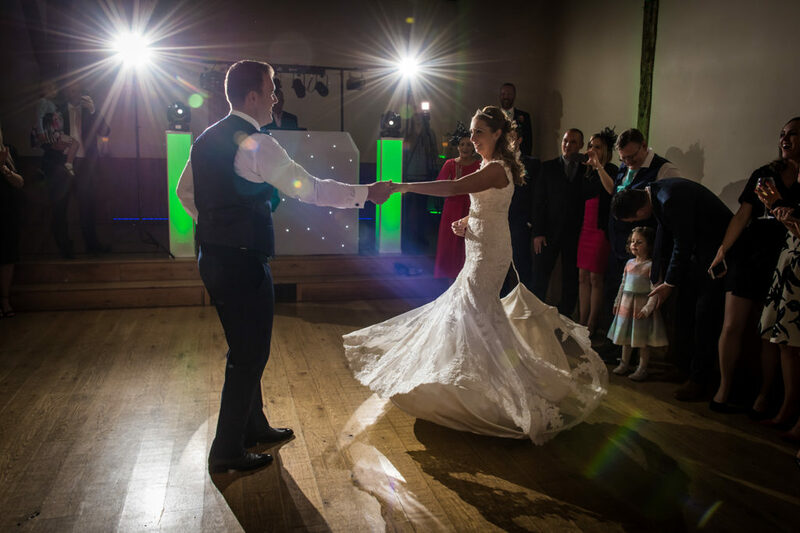 For our all-inclusive packages one of our excellent DJs is provided, or you can have a live band, or play your own music through our professional sound system. 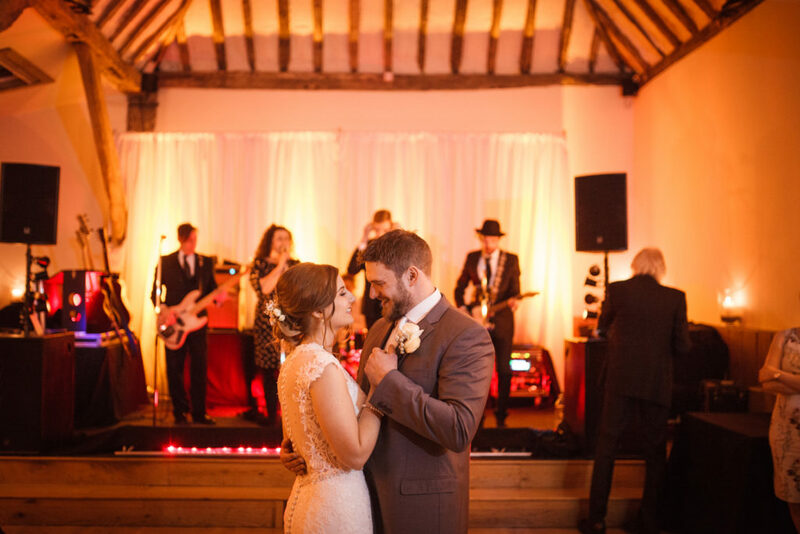 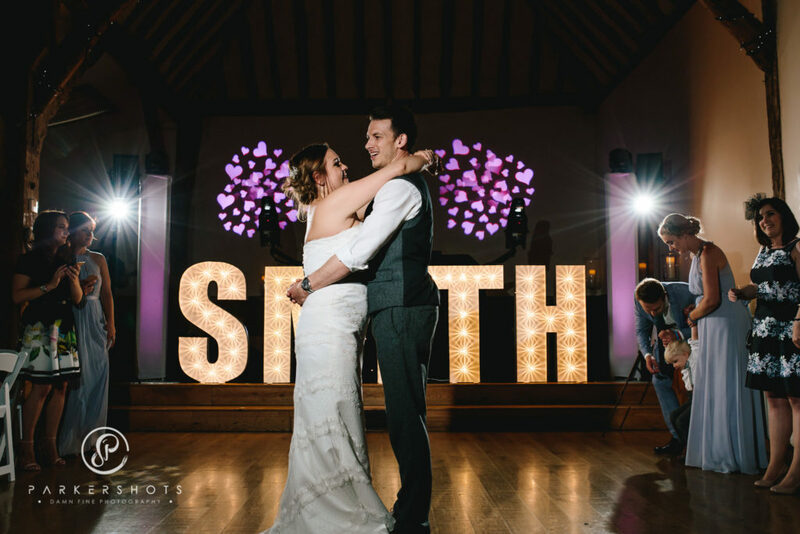 During the day and for the ceremony you can have live music such as a string trio or harpist from our list of recommended suppliers. 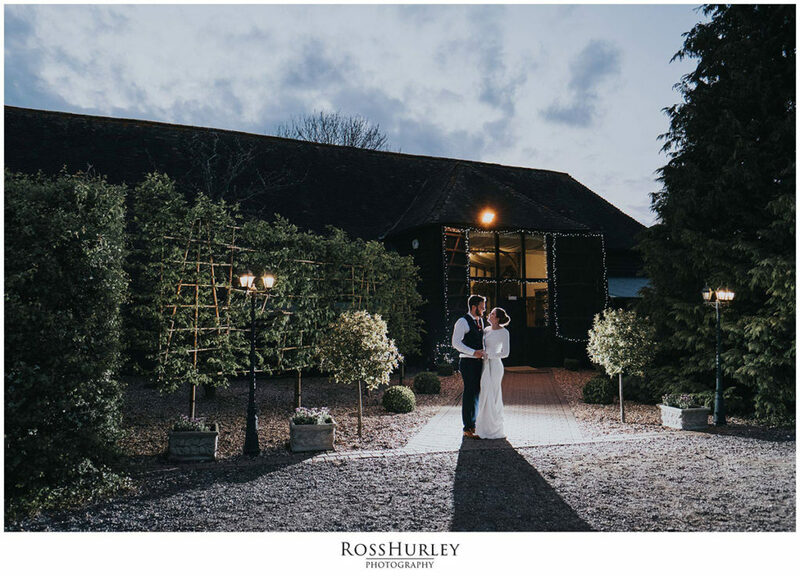 When your day is over and you have waved goodbye to your friends and family, you can unwind and take your time leaving the venue. 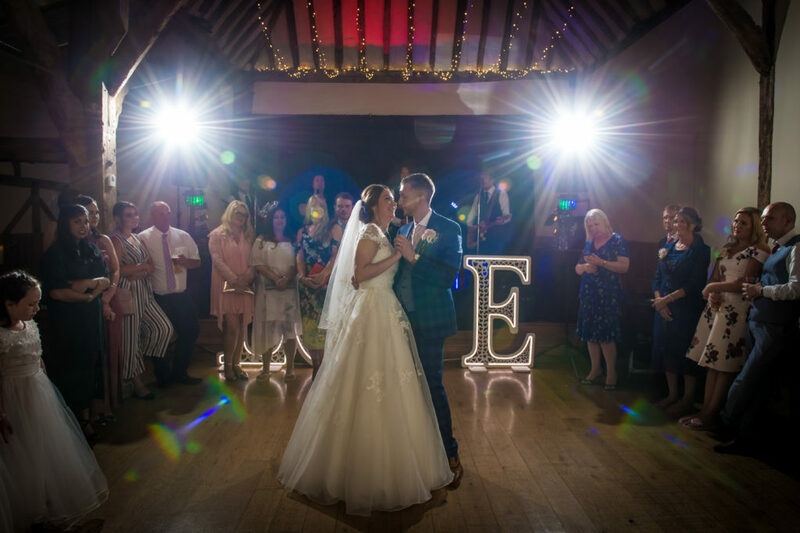 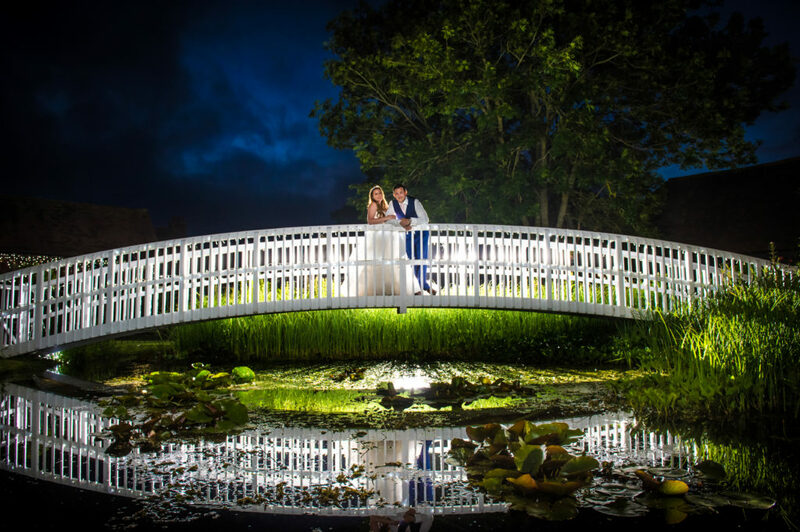 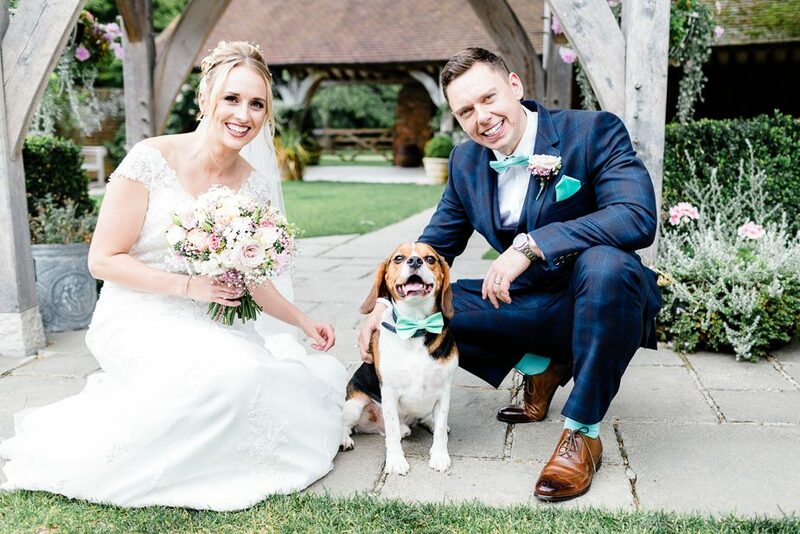 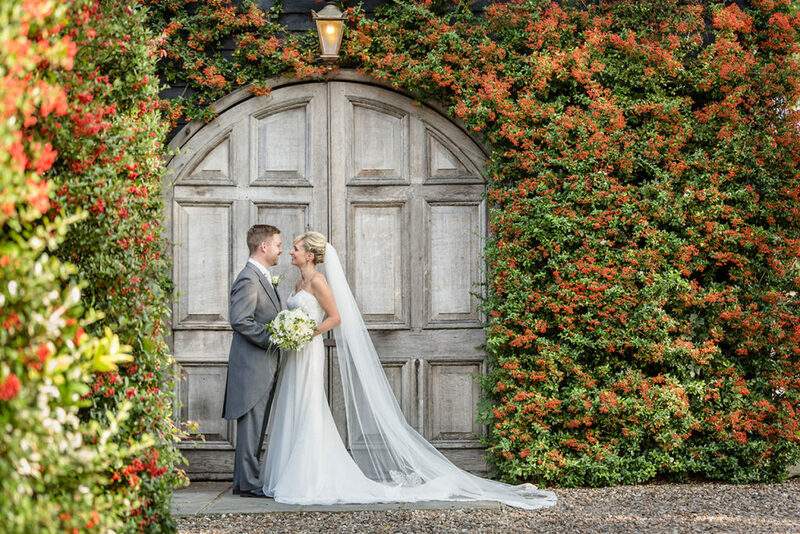 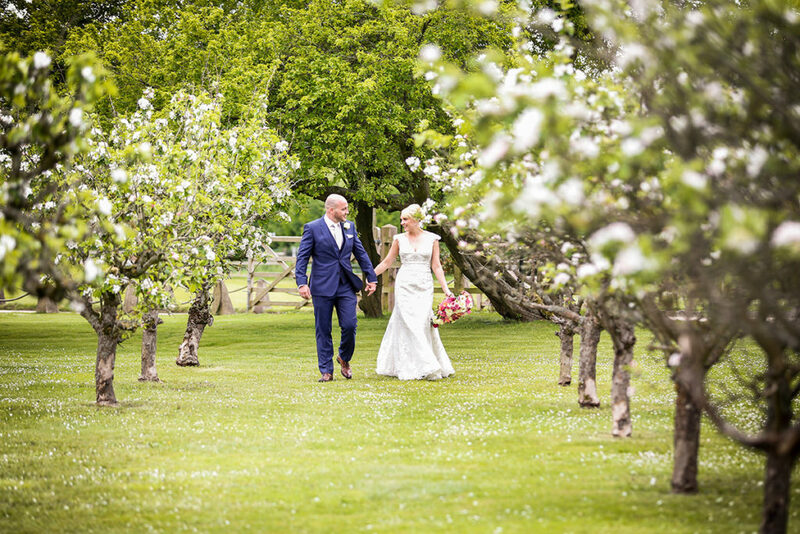 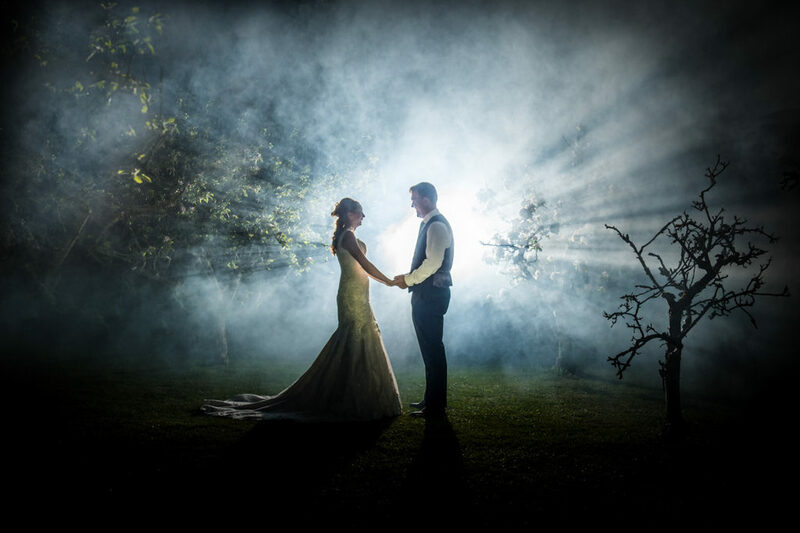 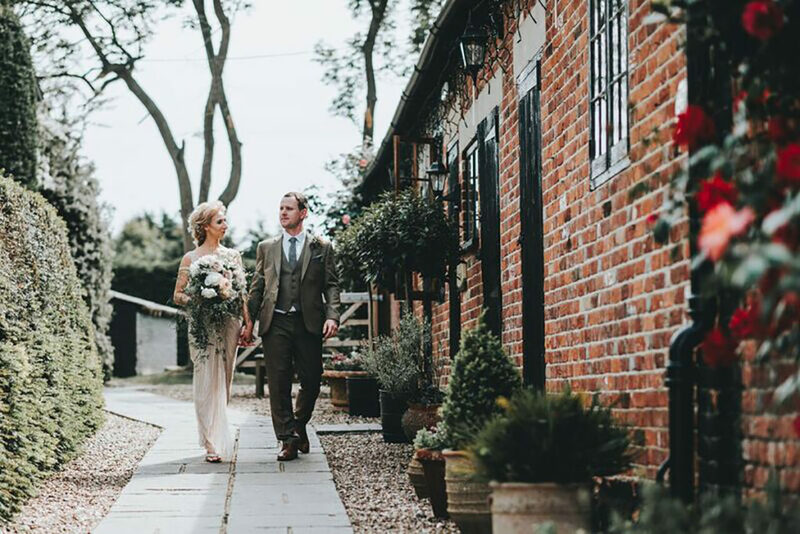 The happy couple can stroll over to their cottage on the estate – a comfortable and romantic haven where you can unwind and reflect on your special day. 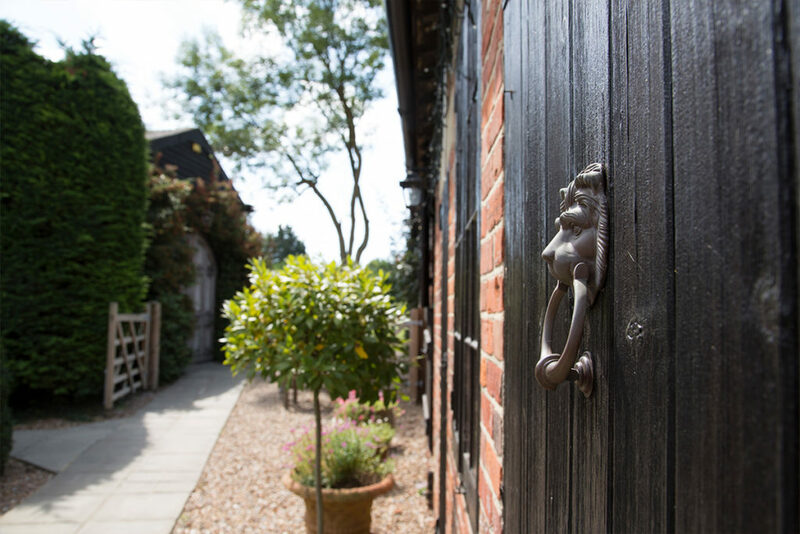 Others can walk to a local B&B or a short five-minute cab ride to the many Canterbury hotels. 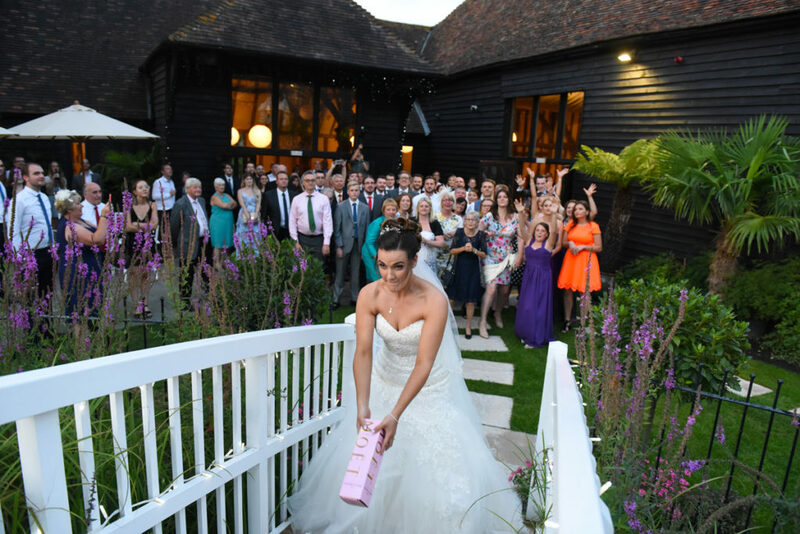 Weddings at Winters Barns are enjoyable and convenient for everyone. 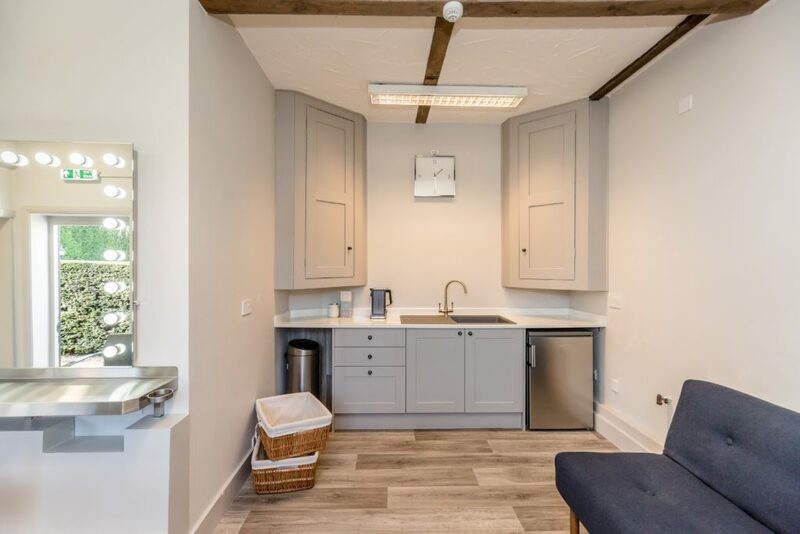 There is a fully accessible toilet in the barns. 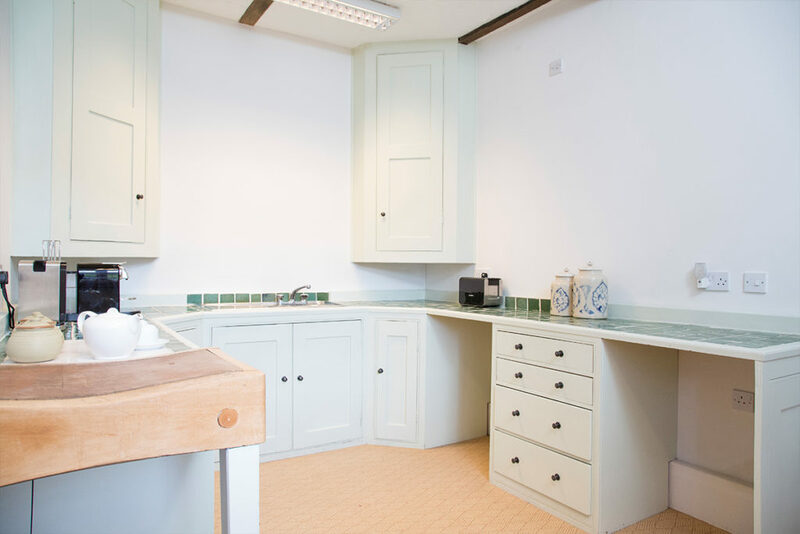 All the amenities are on the ground floor, and there is easy access to the gardens. 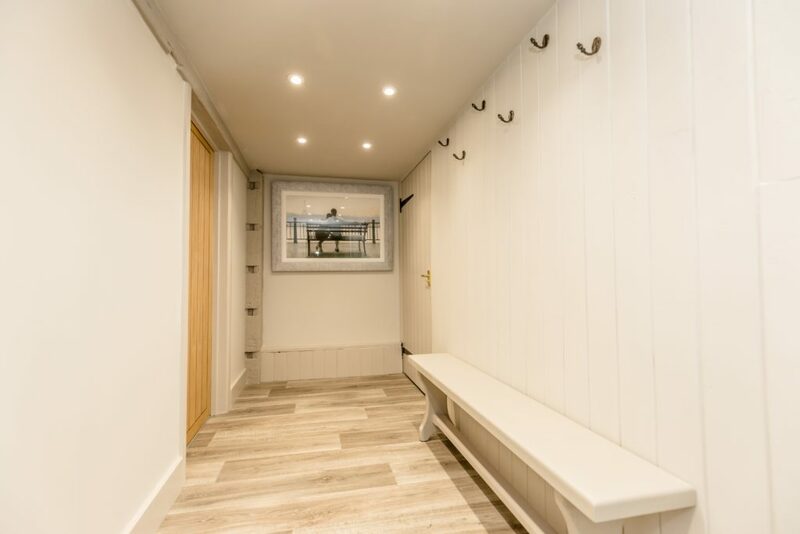 The Cottage also has a fully accessible wet room and toilet.